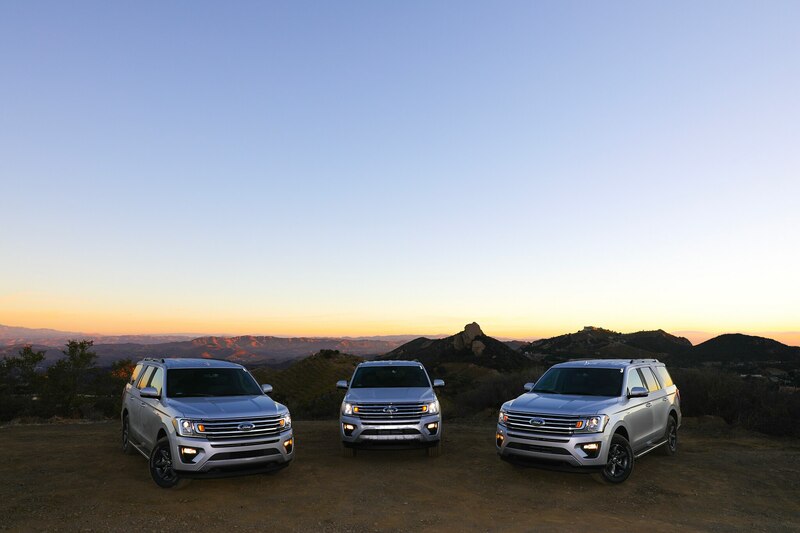 MALIBU, California — Like people, not all vehicles age at the same pace. 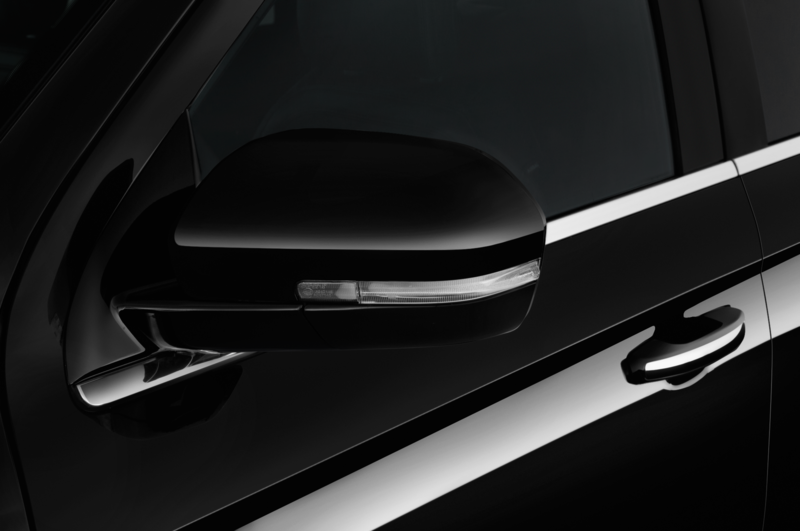 For example the Maserati GranTurismo has held up quite well despite being a decade old, while the Tesla Model S on the other hand doesn’t look nearly as futuristic five years on as it did when it was brand-spankin’-new. 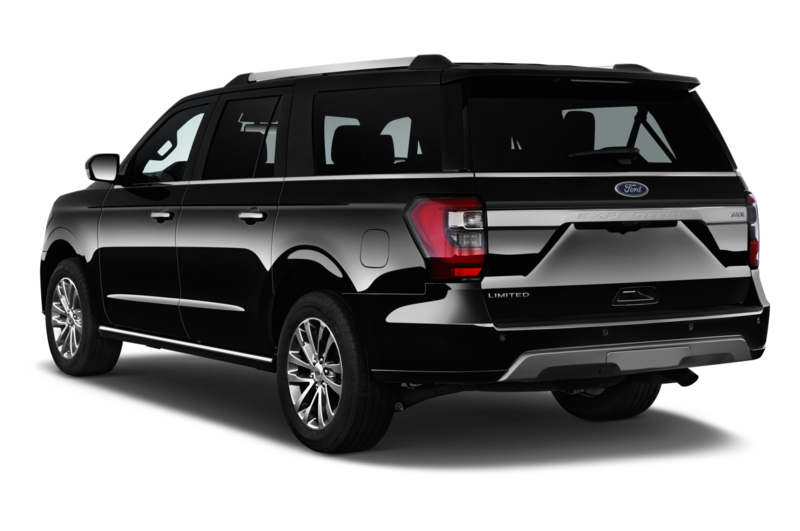 Then there’s the present generation Ford Expedition, which entered the market in late 2006. 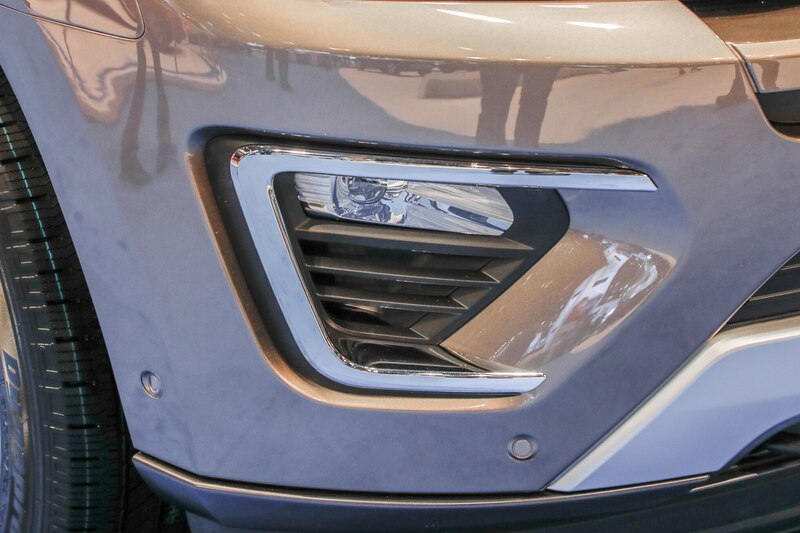 It had begun to look positively dinosaurian. 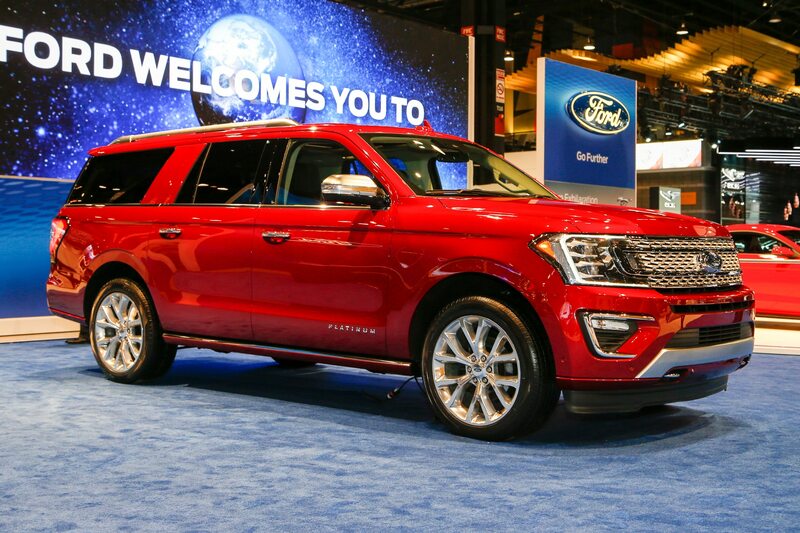 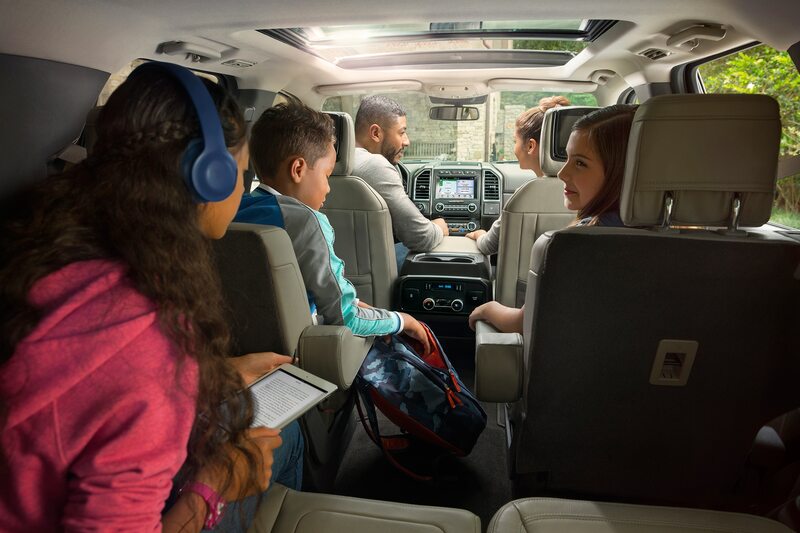 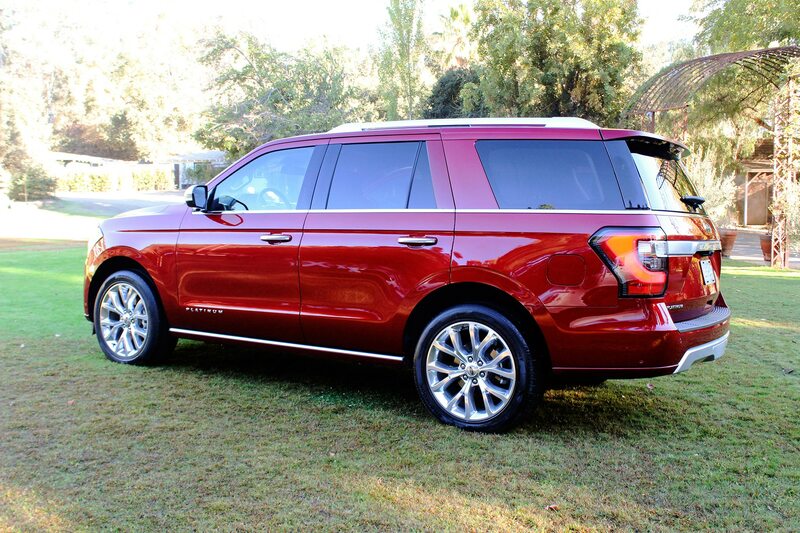 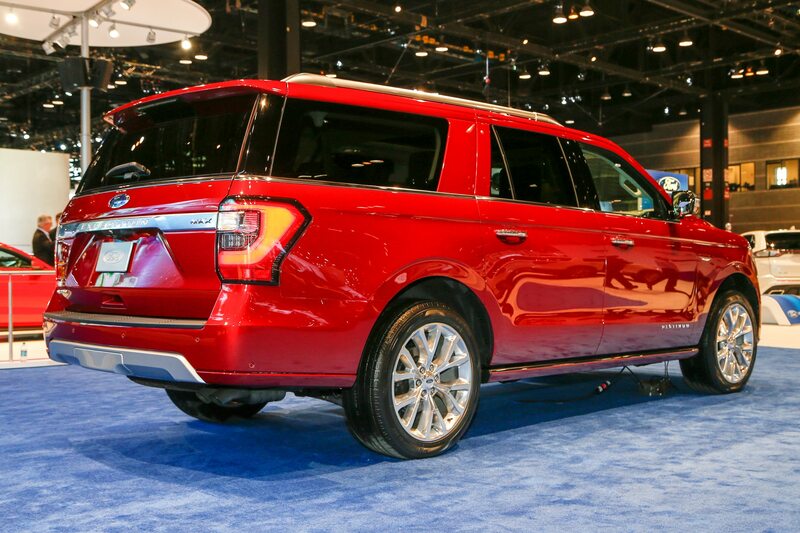 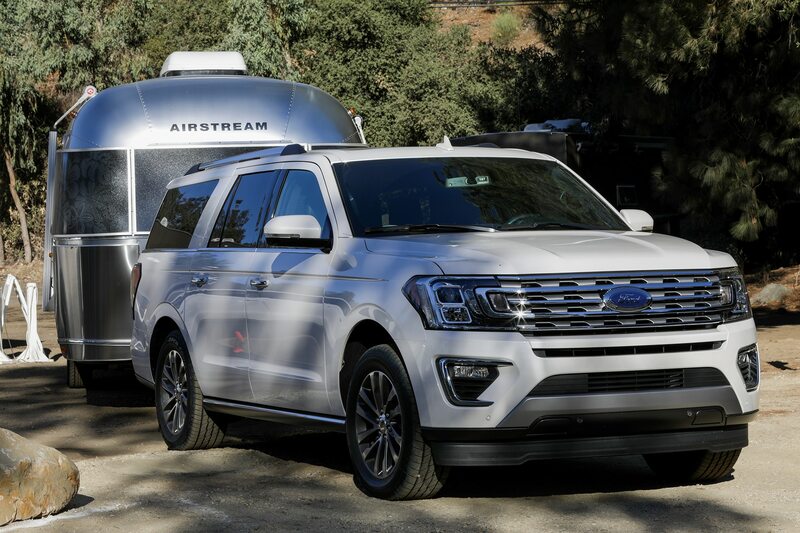 So the timing couldn’t be better for the arrival of the all-new, fourth-generation 2018 Ford Expedition. 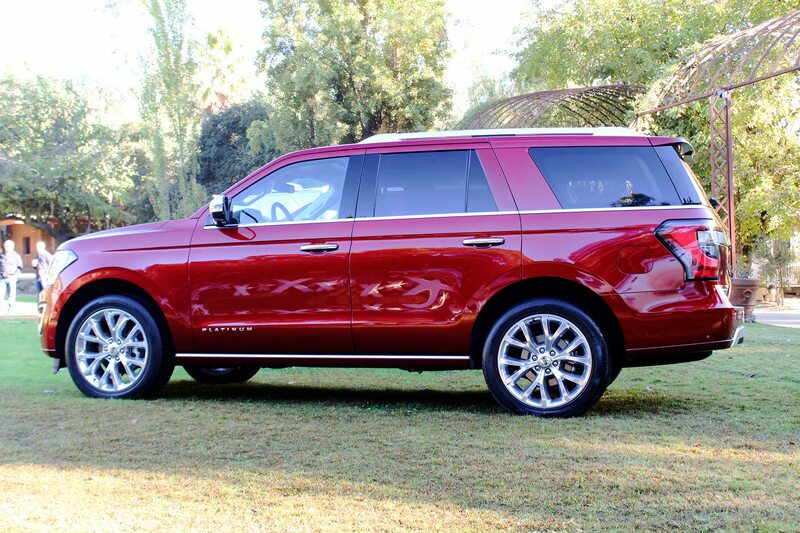 Having just driven the new 2018 Lincoln Navigator a couple weeks prior, I had some idea of what to expect from the Blue Oval’s biggest SUV. 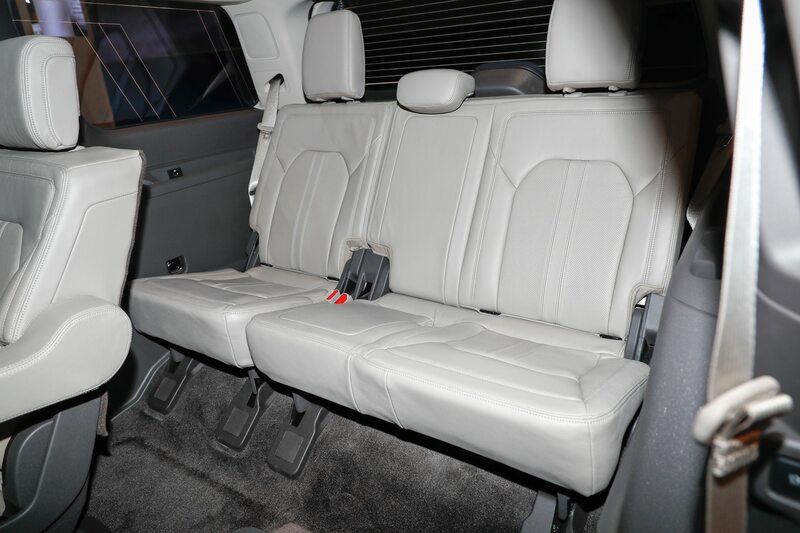 But the differences between the two siblings are more significant than ever before. 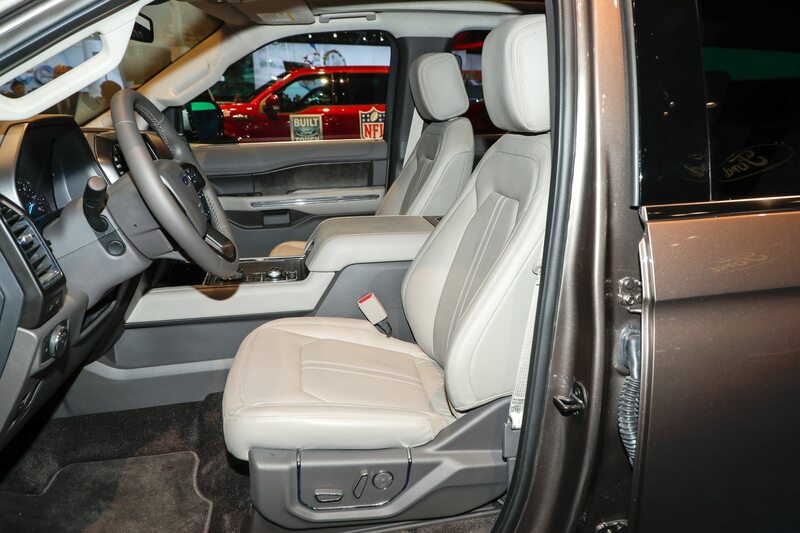 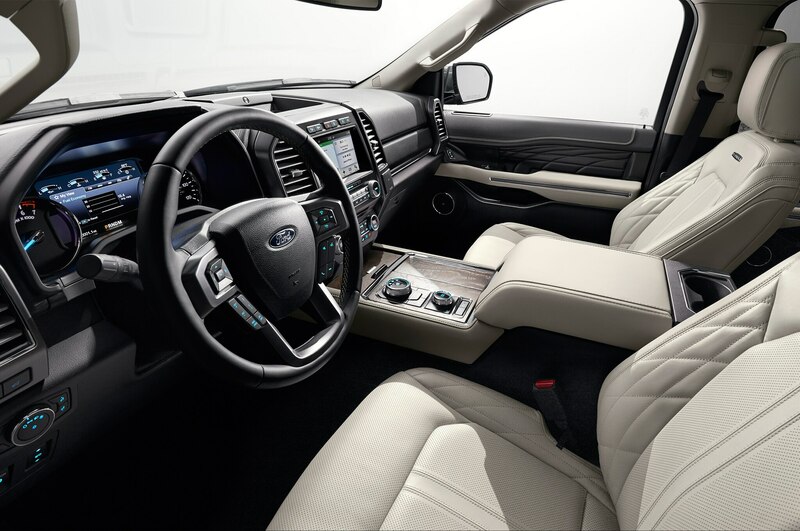 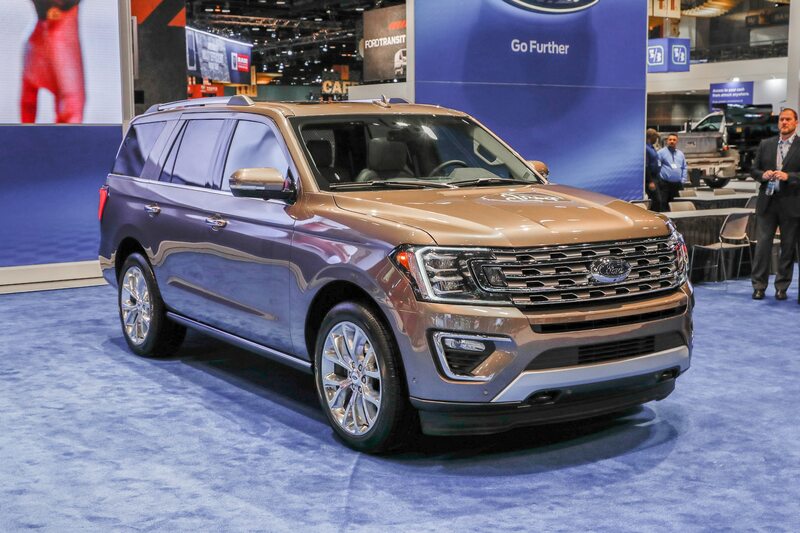 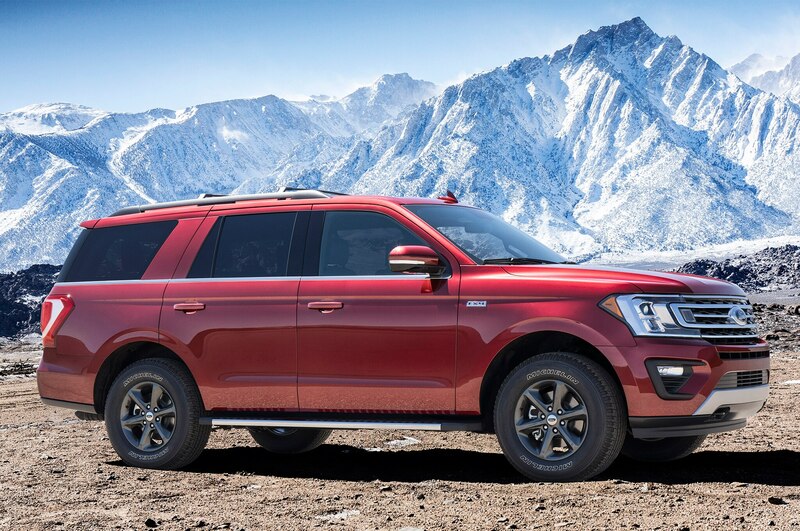 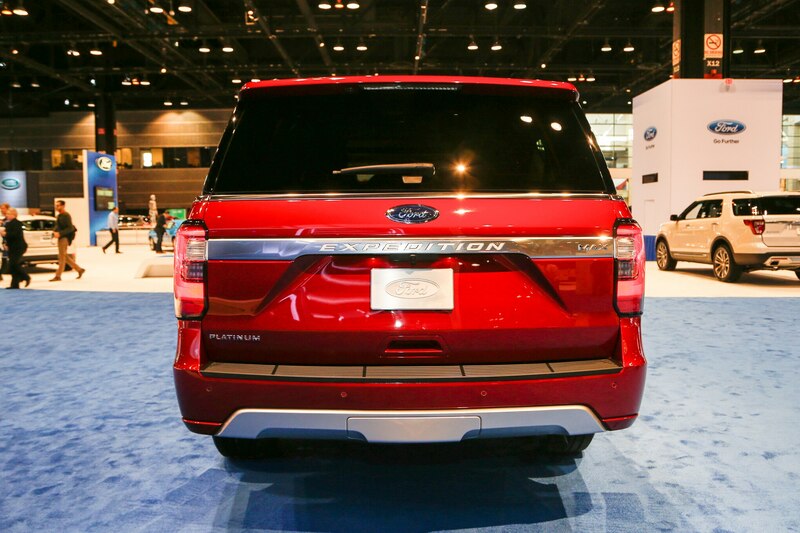 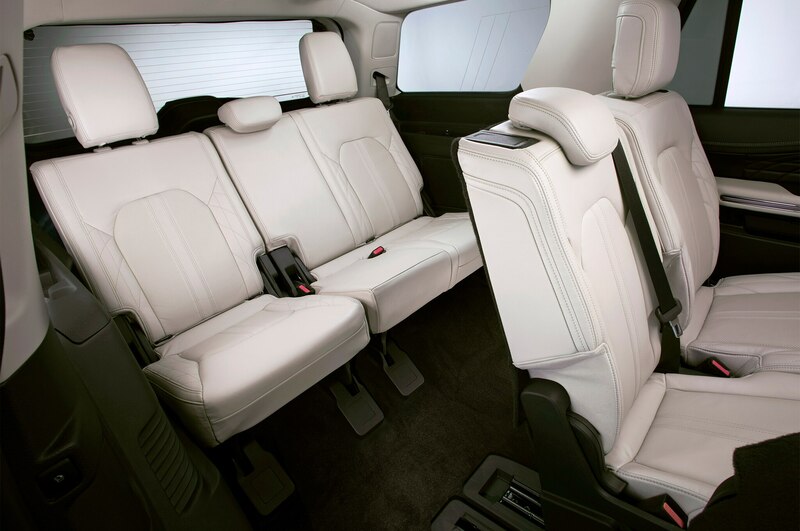 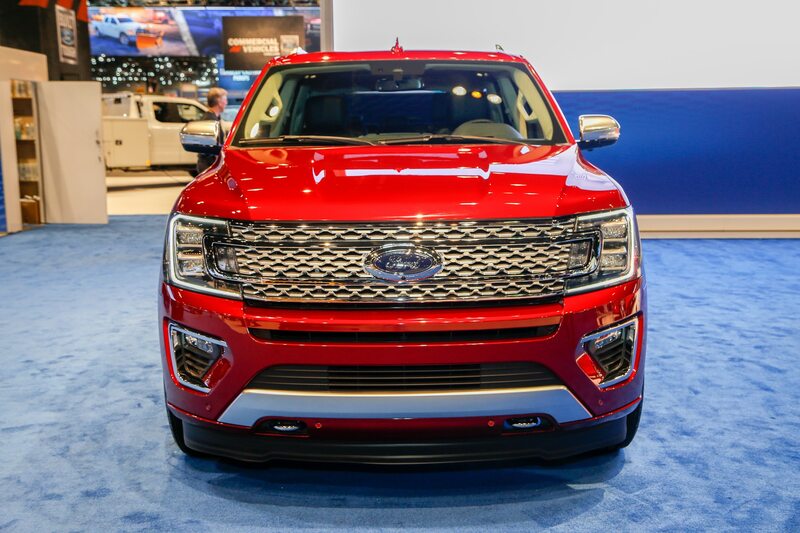 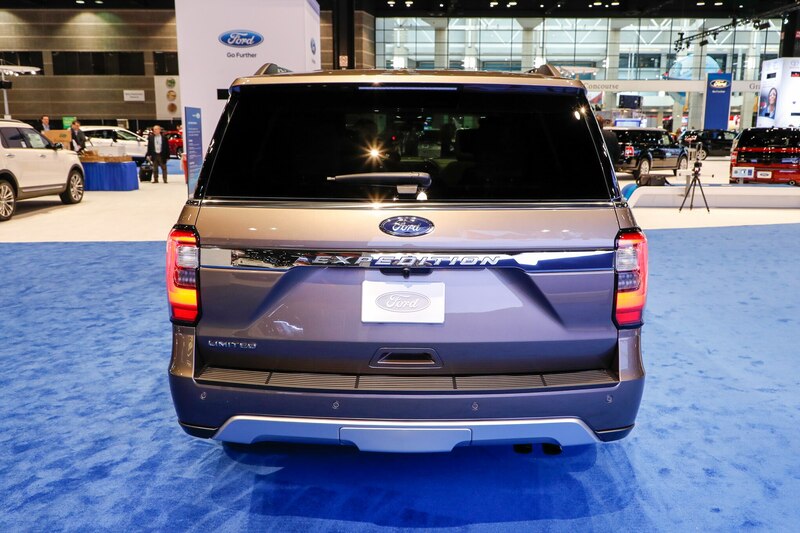 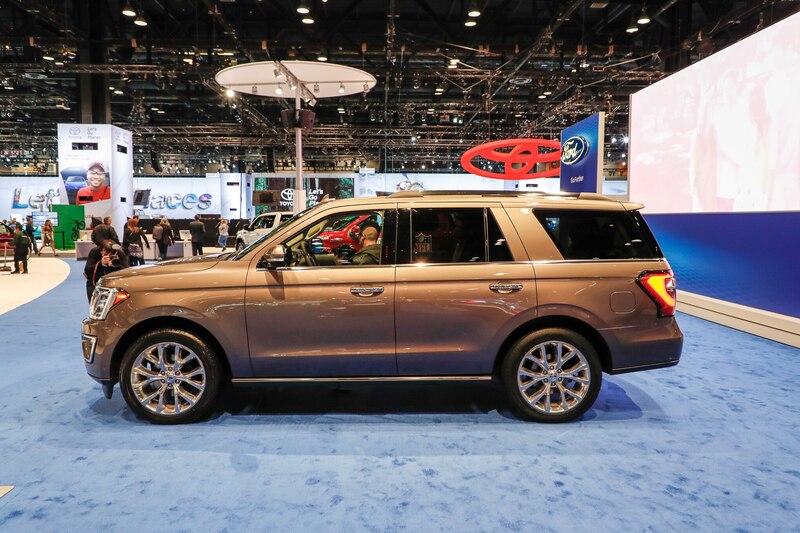 Unlike the Navigator, the Expedition doesn’t suffer from any visual proportionality issues, occupying its space confidently without being imposing. 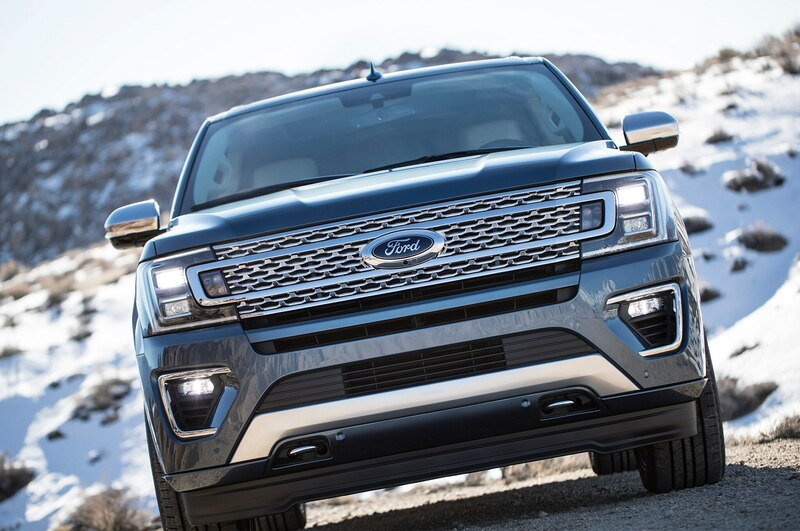 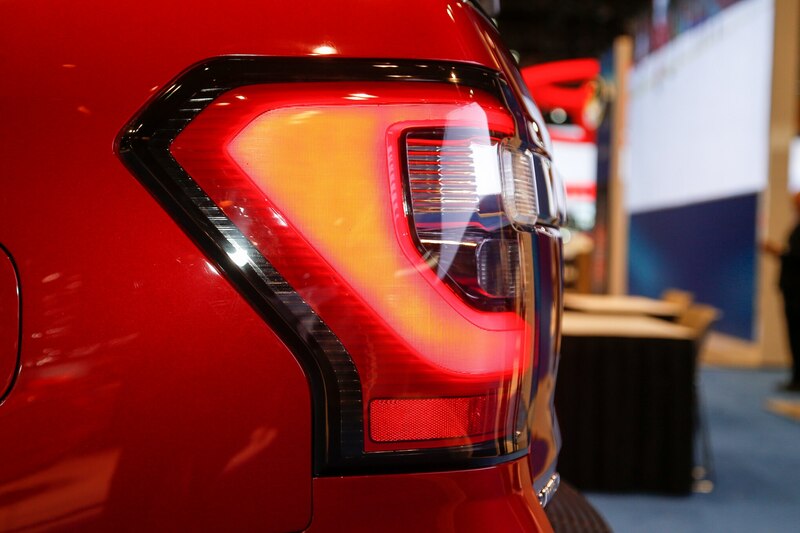 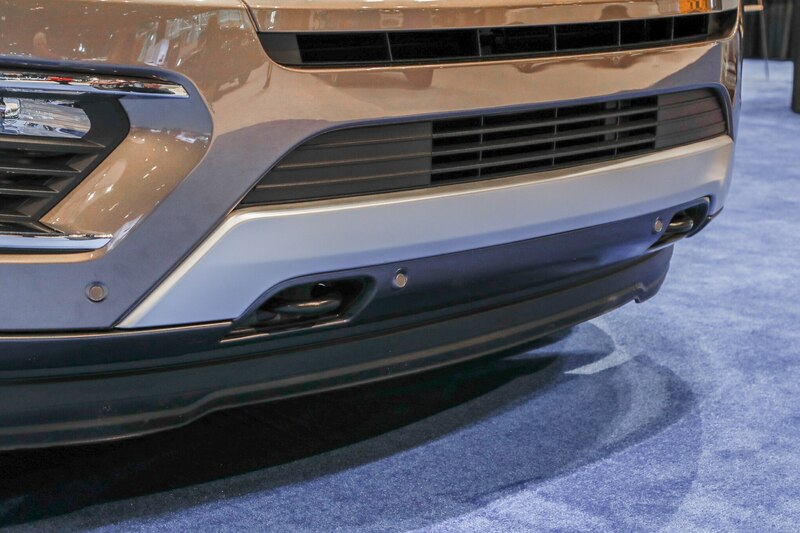 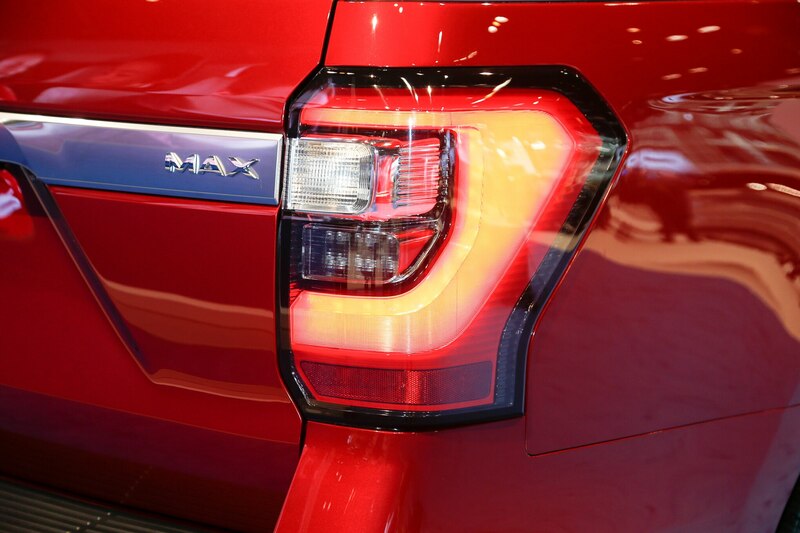 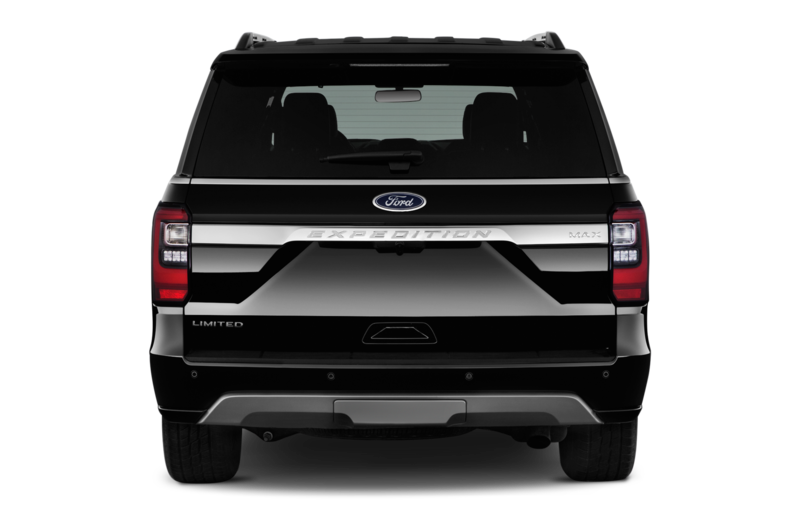 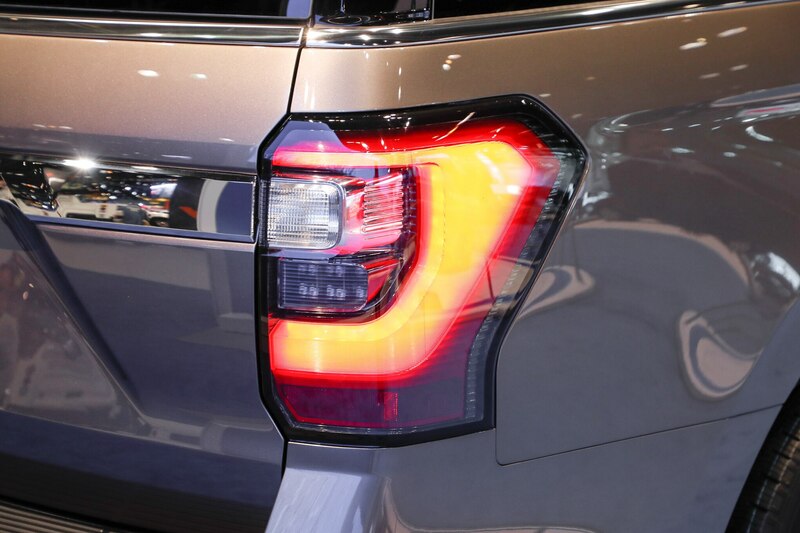 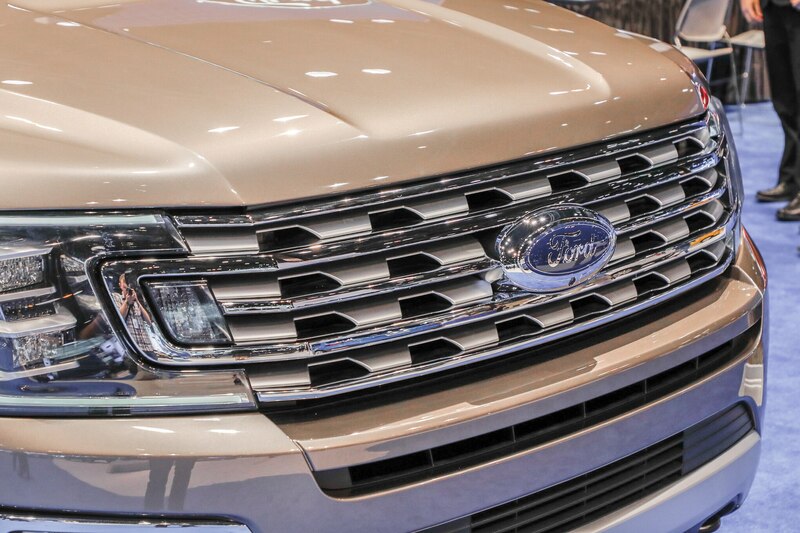 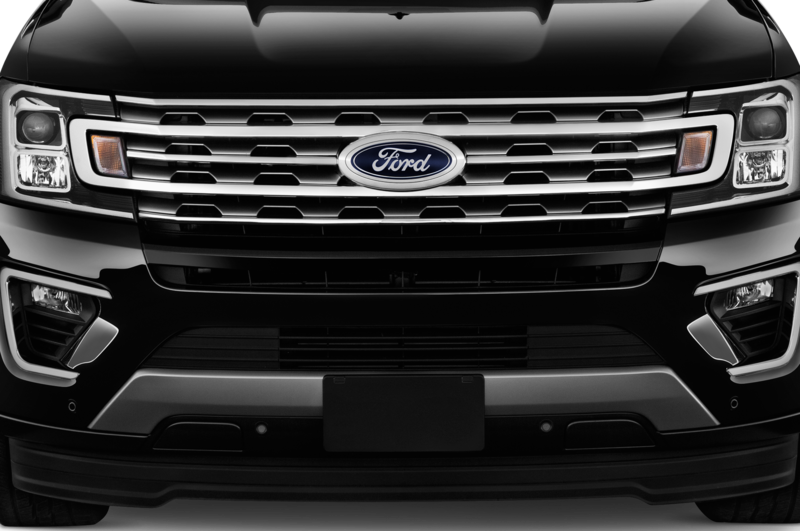 The Expedition’s conventional look, horizontal-pattern grille avoids the squished appearance of the Lincoln, while its F-150-style taillamps appear better suited to the rear end. 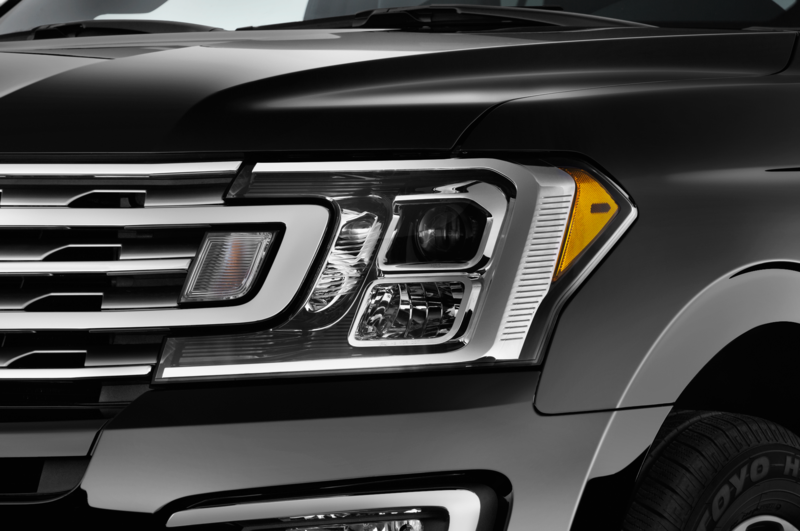 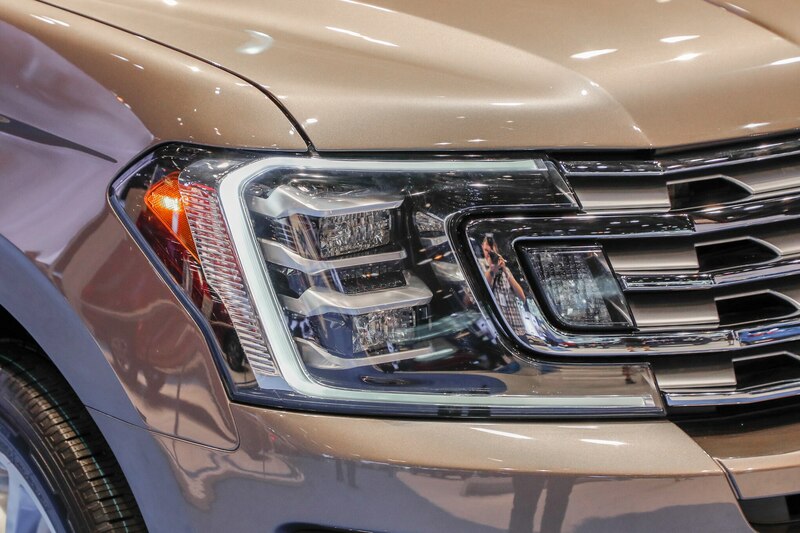 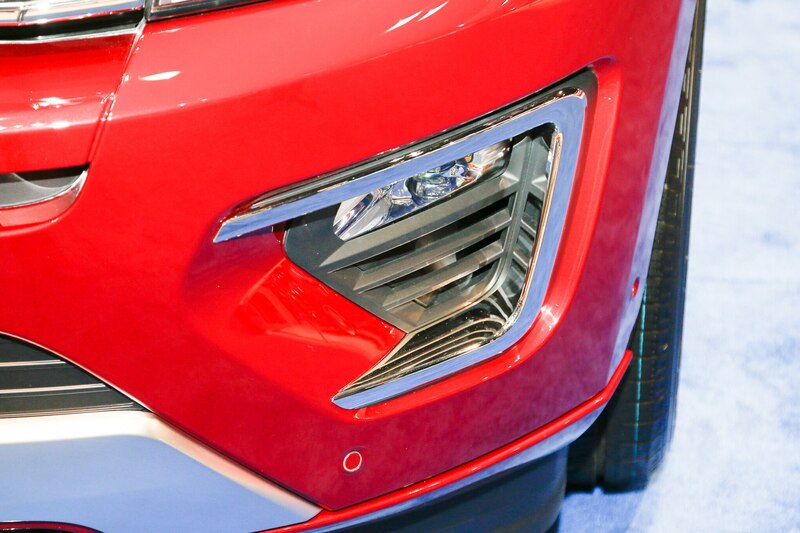 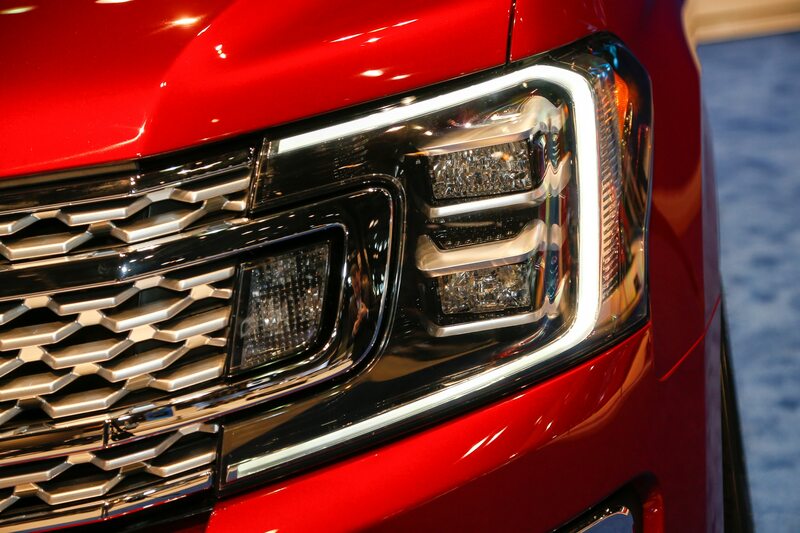 If there’s one flaw with the Expedition’s design, it’s that its headlights blend almost too well with its grille, making for a single-piece look reminiscent of Geordi La Forge’s visor from “Star Trek: The Next Generation.” The effect is more pronounced on the Platinum than the Limited and XLT, which use simpler, blade-style grilles as opposed to the Platinum’s mesh. 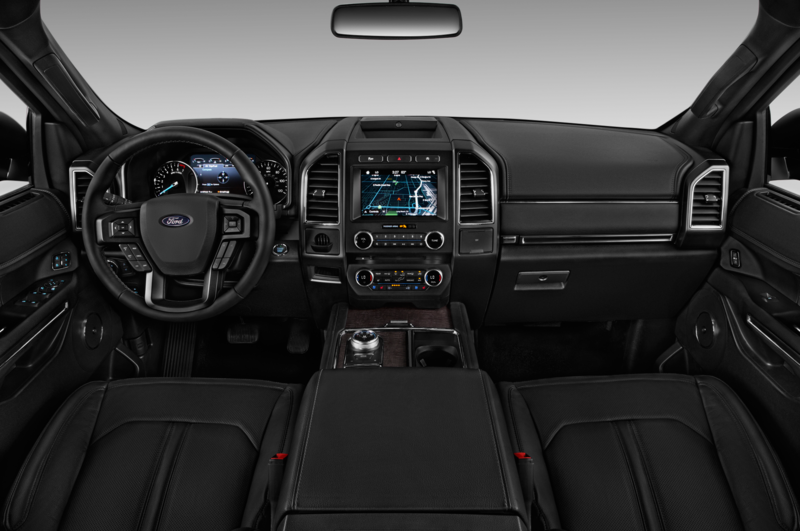 Inside, as is traditional for the Expedition, its cabin borrows heavily from the F-150 parts bin, which suits the SUV’s trucky personality. 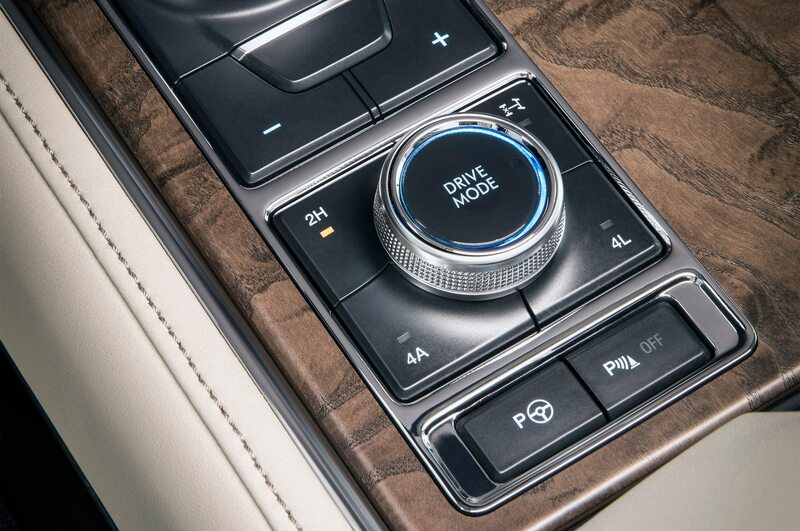 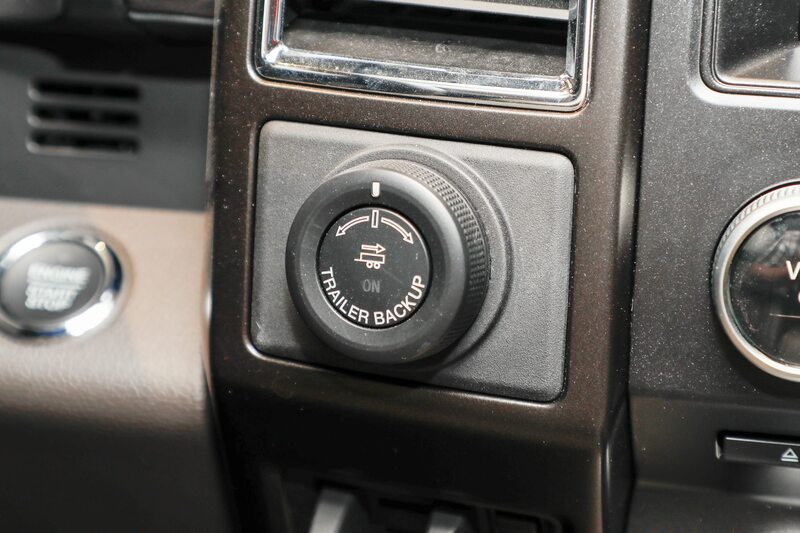 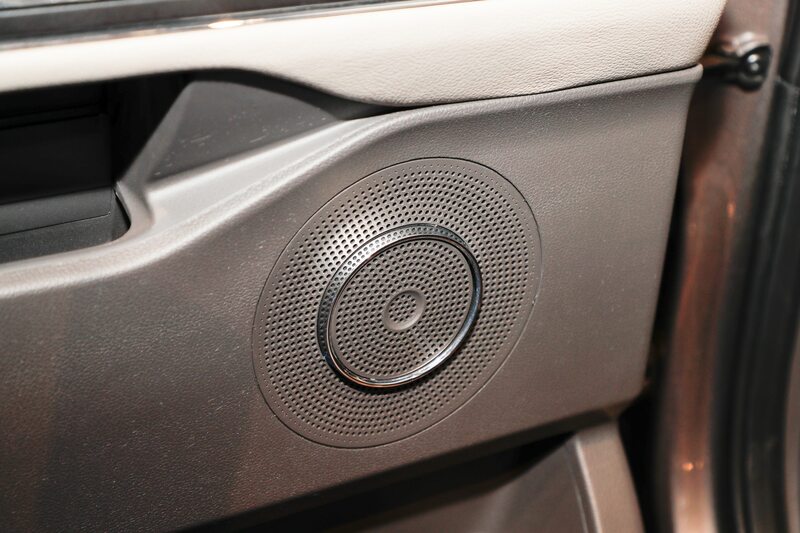 The use of two rotary knobs close together on the center console—one for the gear selector, the other for the drive modes—isn’t an ideal setup, but there’s nothing to complain about visually or functionally. 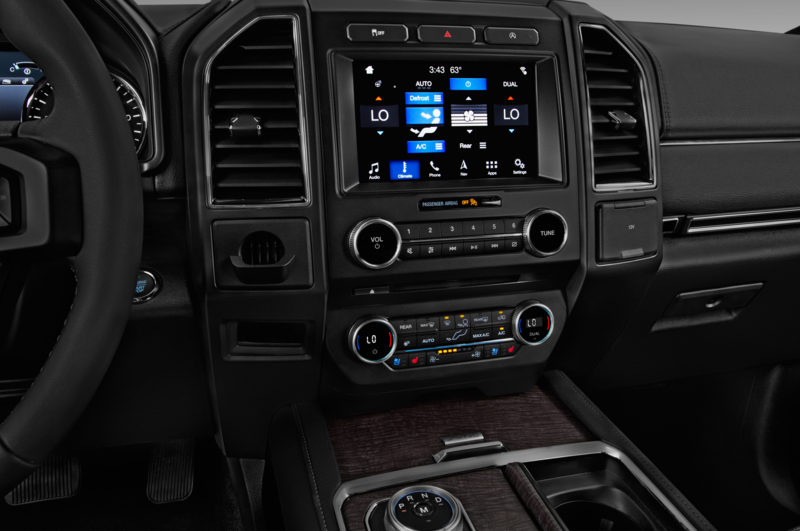 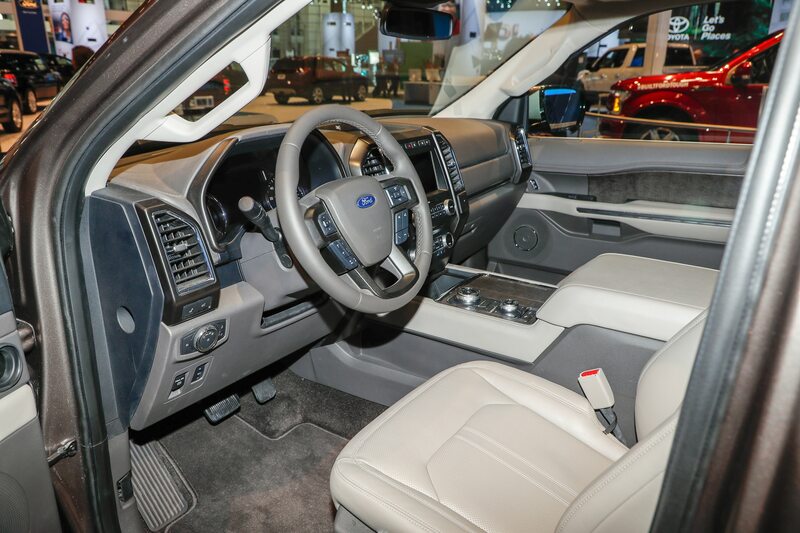 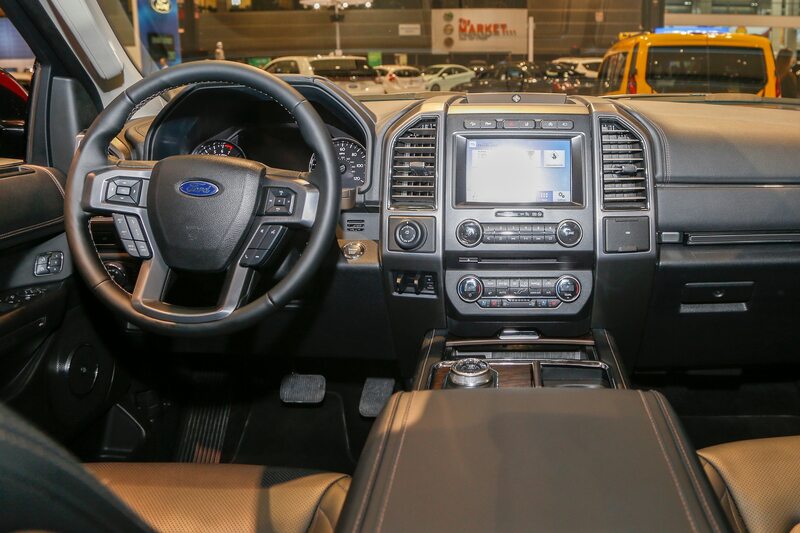 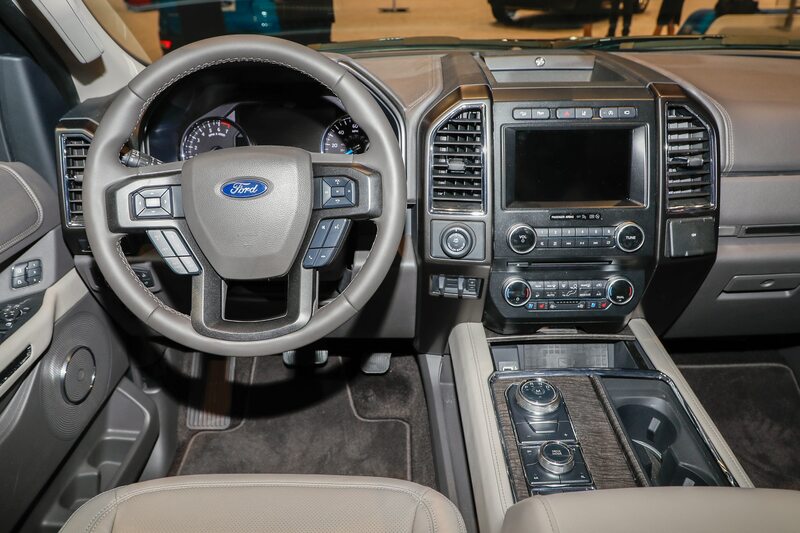 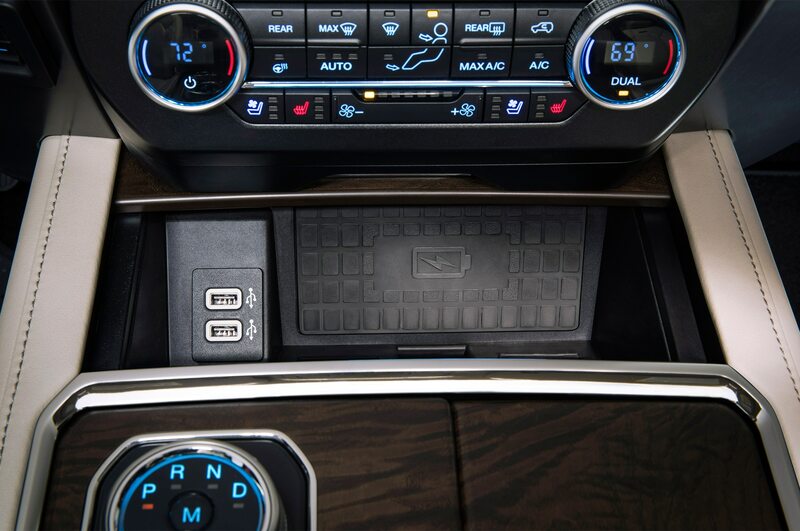 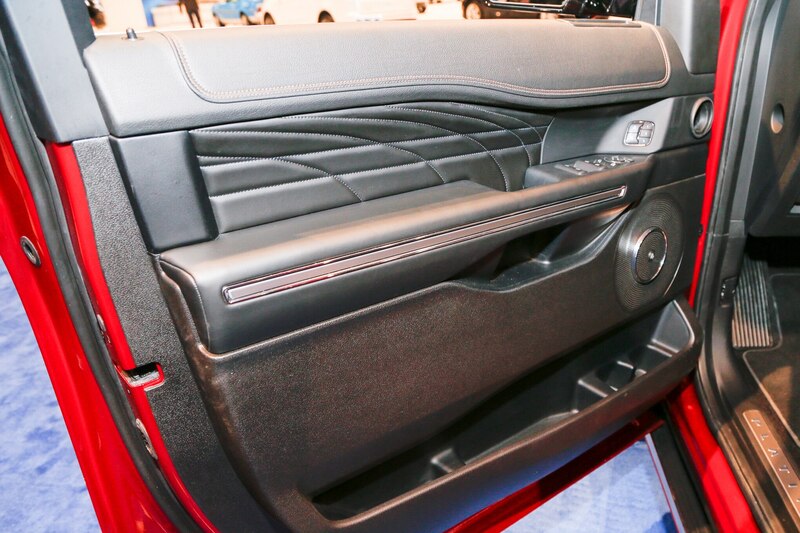 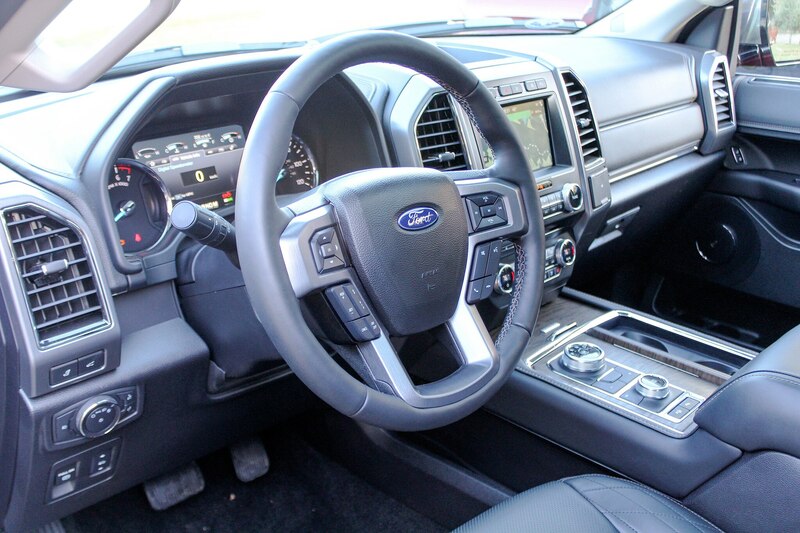 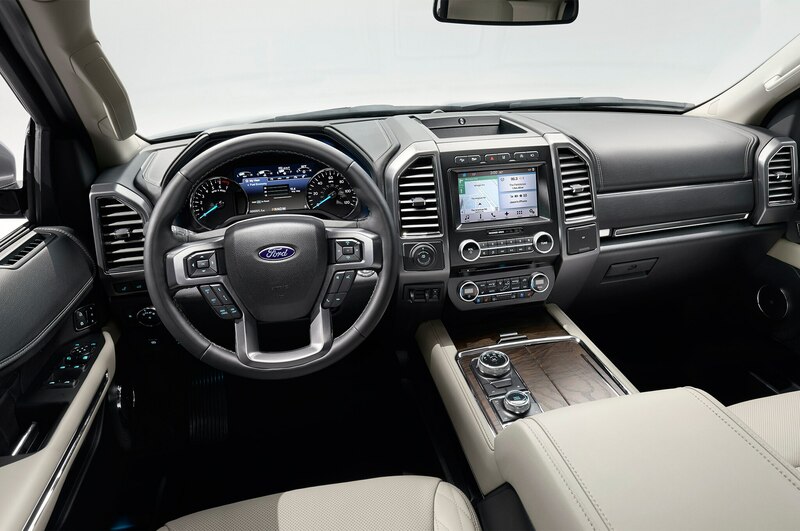 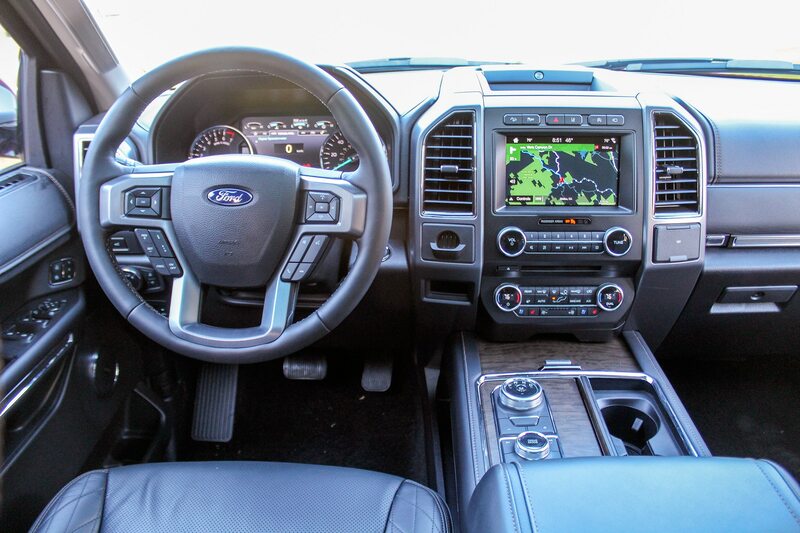 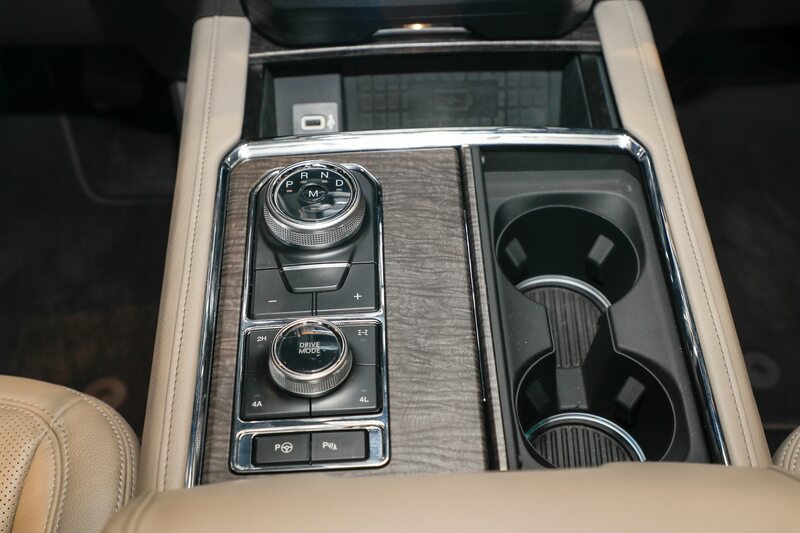 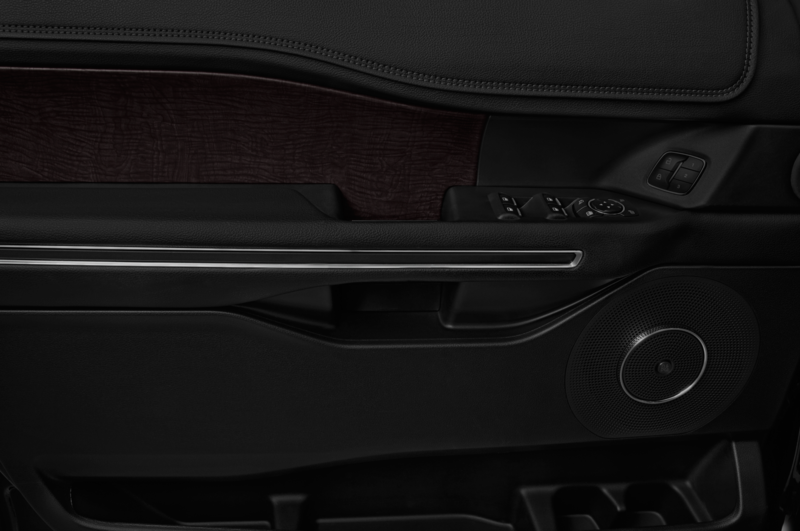 (The center console also happens to be the only place inside the Expedition to be made of wood.) 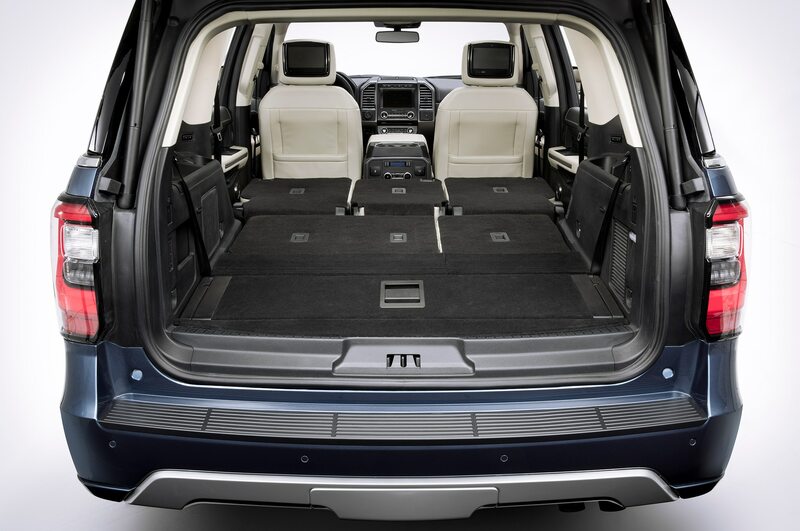 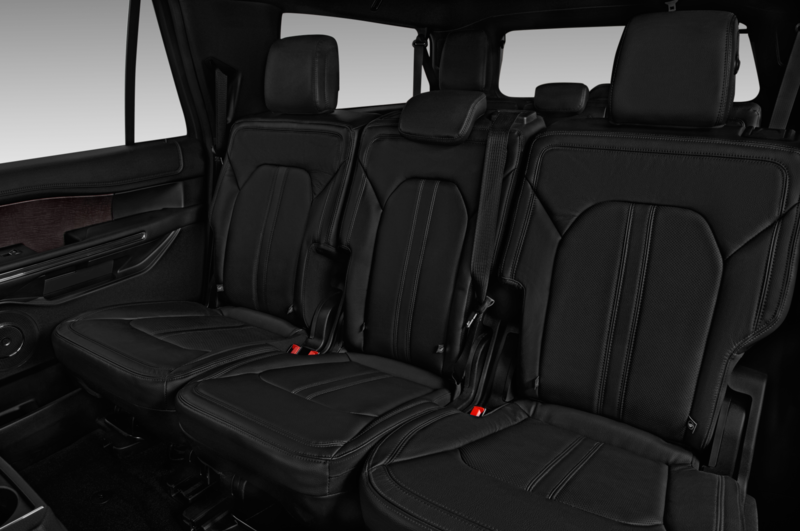 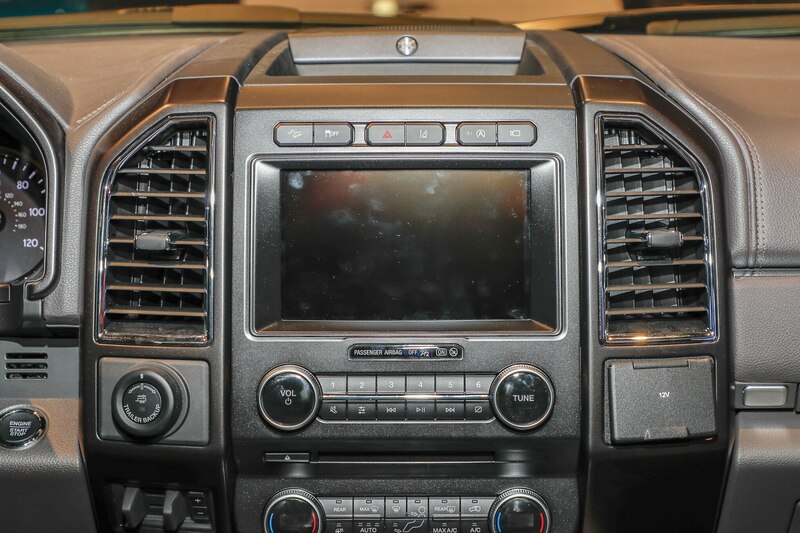 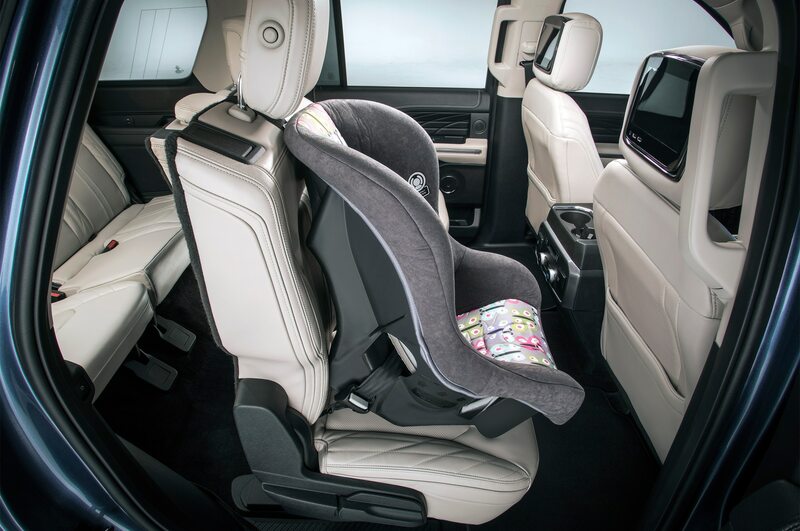 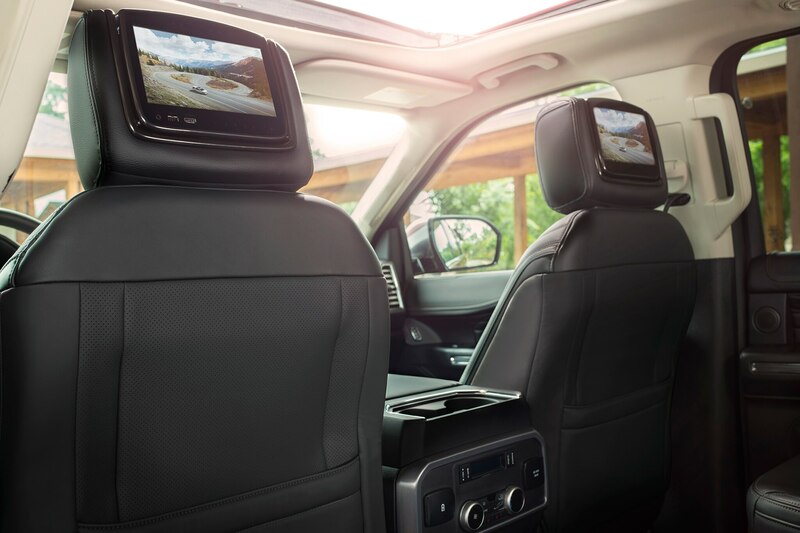 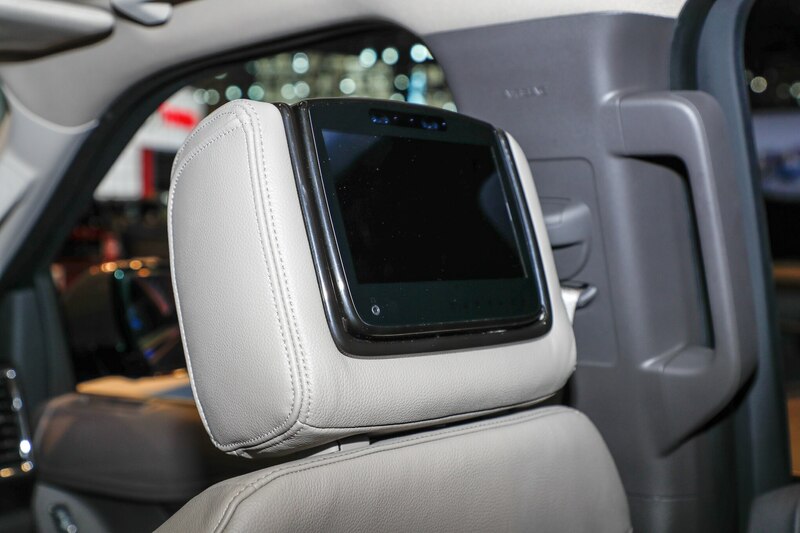 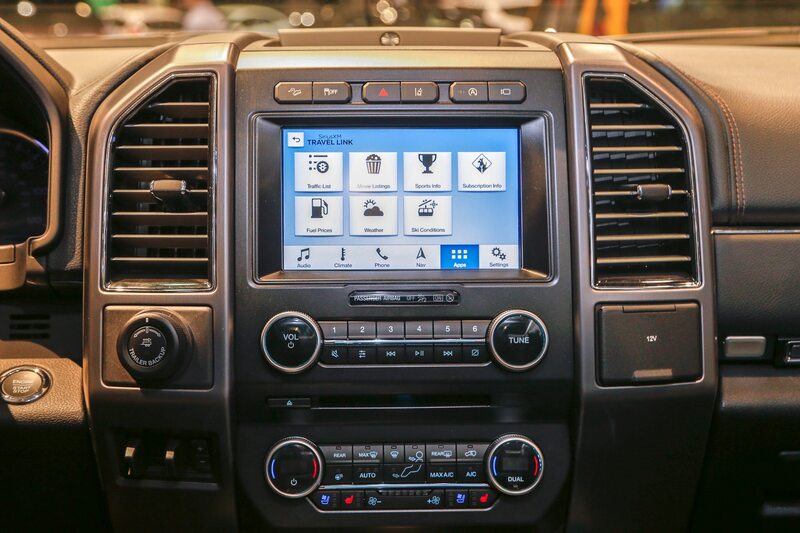 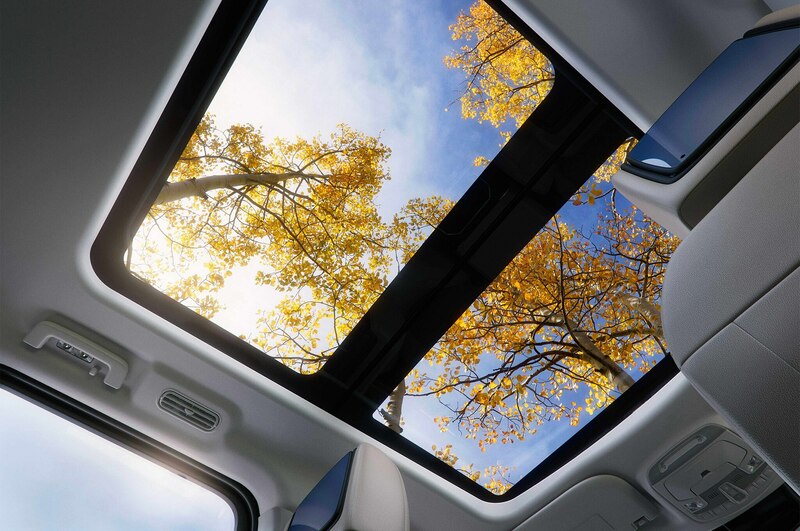 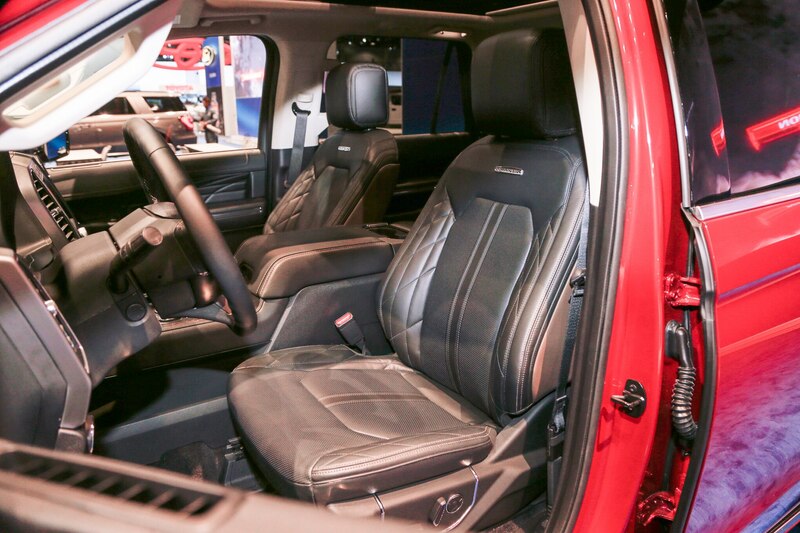 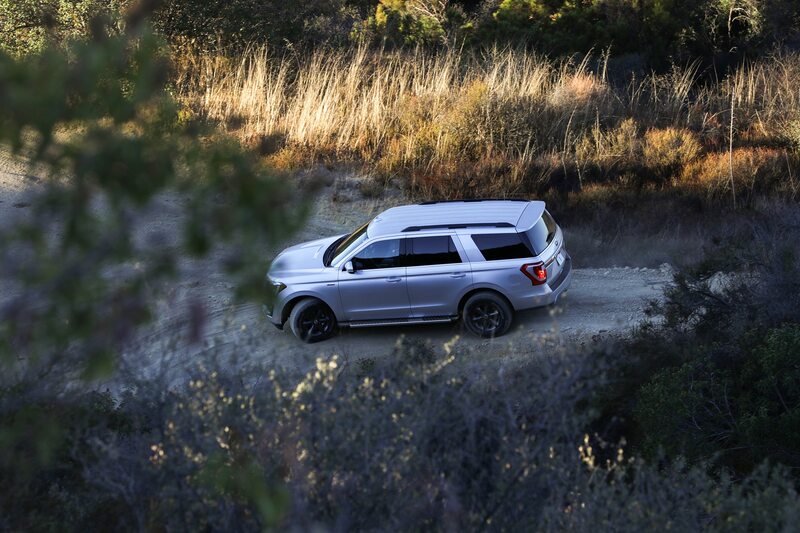 It may not offer the sumptuous luxury and craftsmanship of the Navigator Black Label, but overall materials quality is on par with the base level Navigators to our eyes. 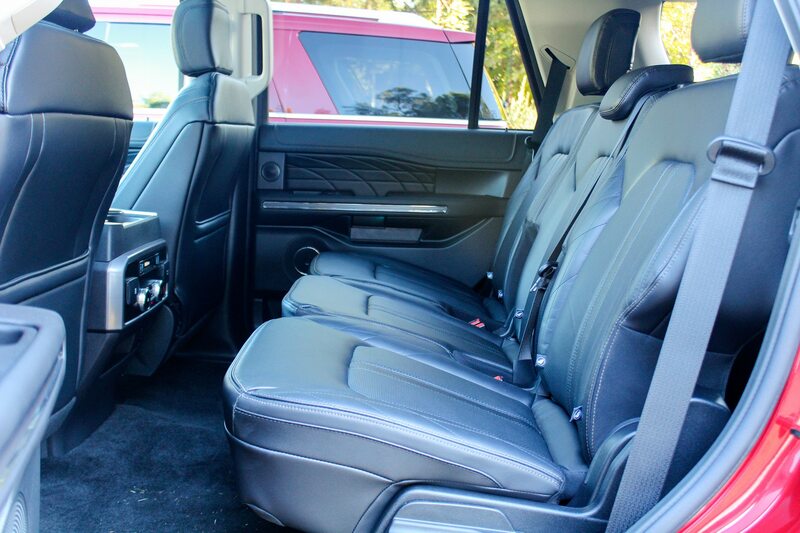 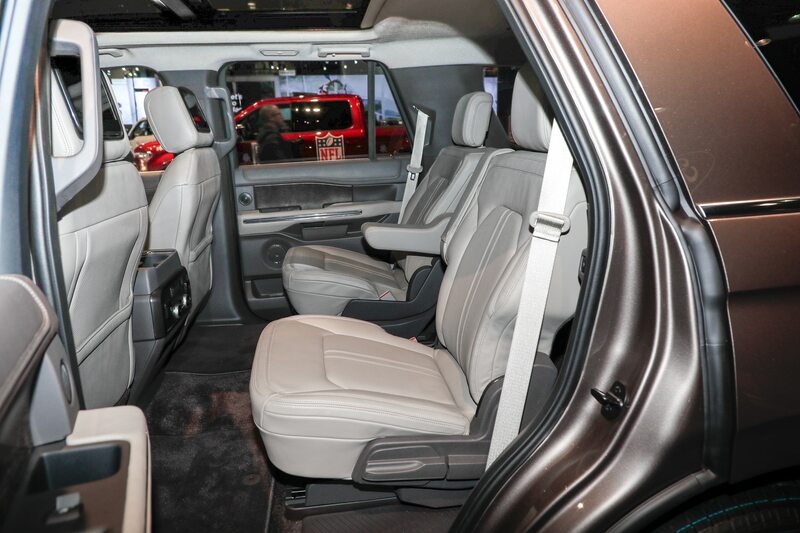 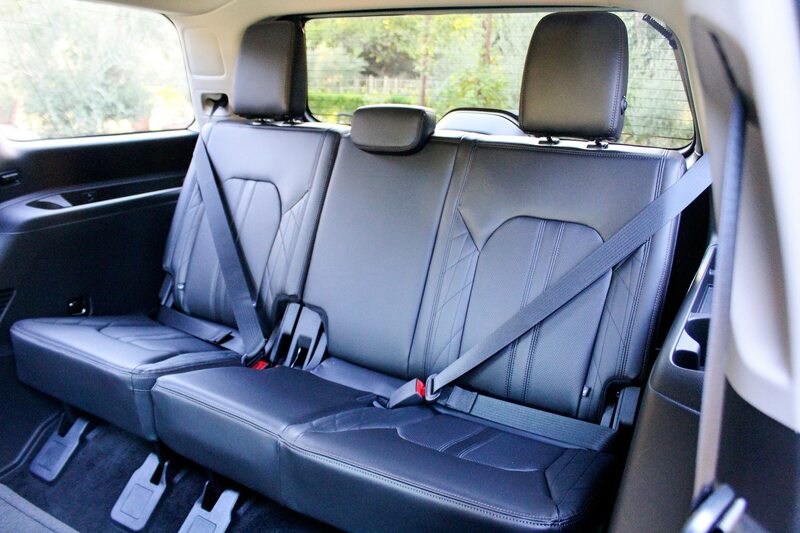 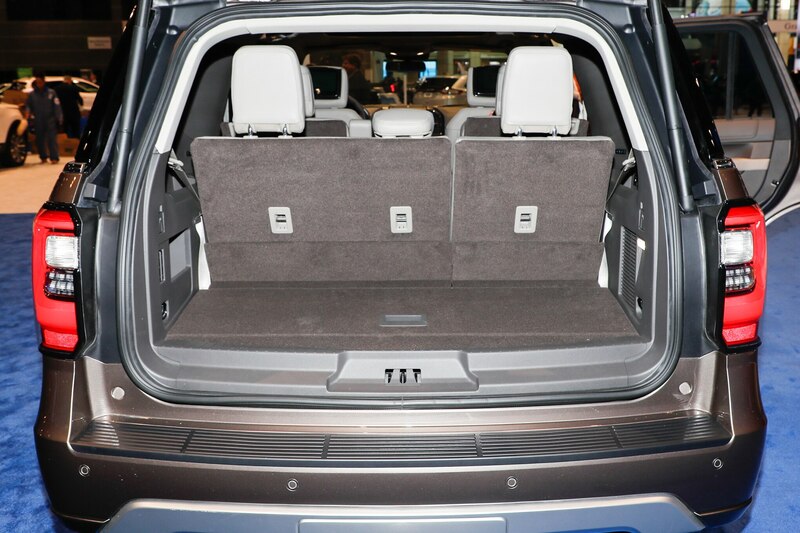 Passenger room is ample in all three rows, even for a six foot, four inch adult, so you can easily fit the starting five of your local hockey team inside. 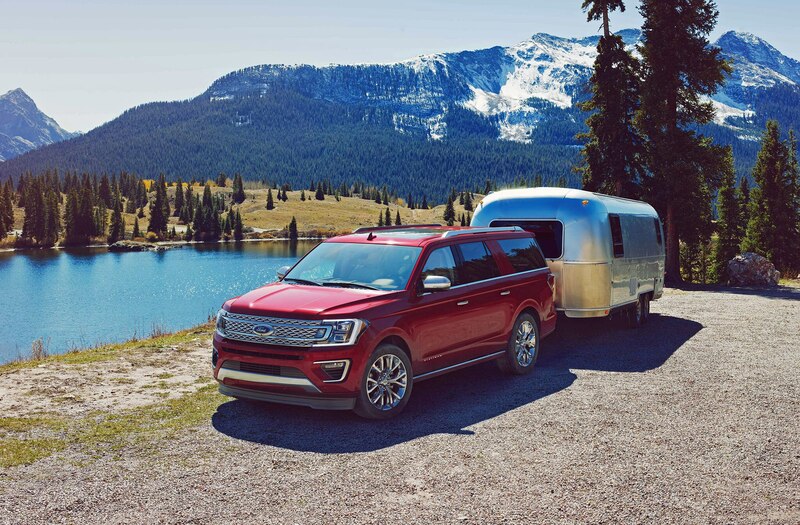 But if you’re hauling the entire first line and their gear you’ll want to swing for the long-wheelbase Expedition Max, which offers 36.0 cu-ft behind the third row instead of a mere 20.9 cu-ft. 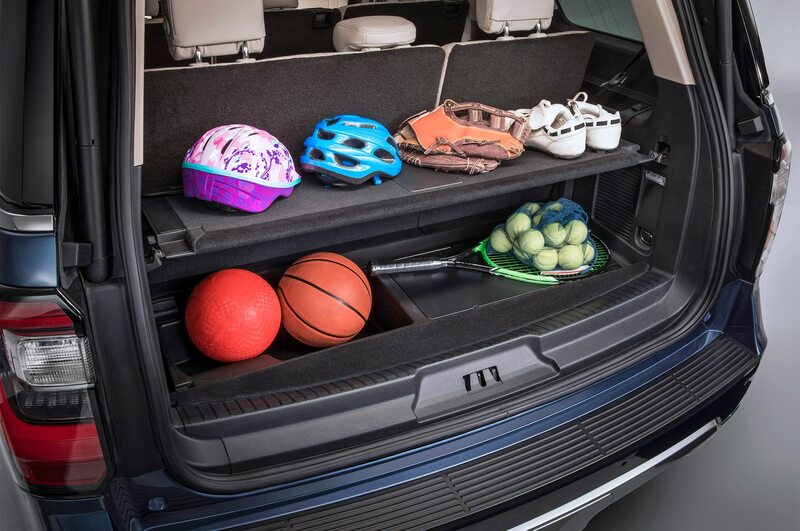 Especially if you, the driver, are also the goalie. 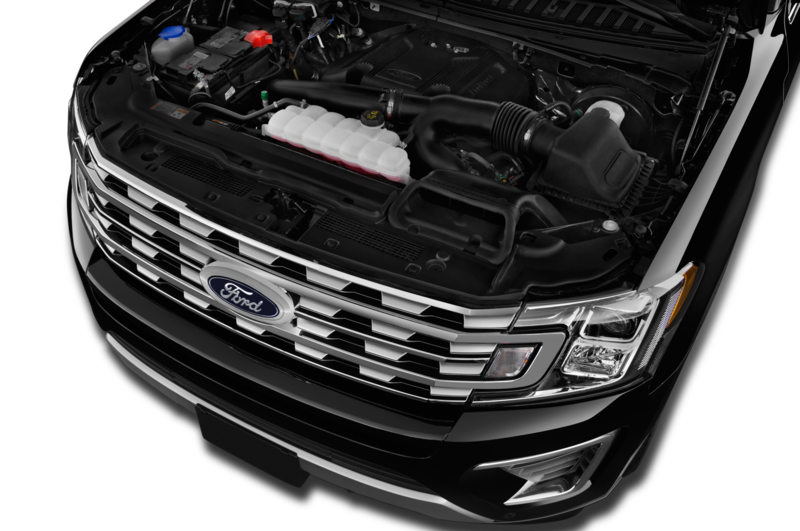 Powering all 2018 Expeditions is Ford’s familiar 3.5-liter EcoBoost twin-turbo V-6. 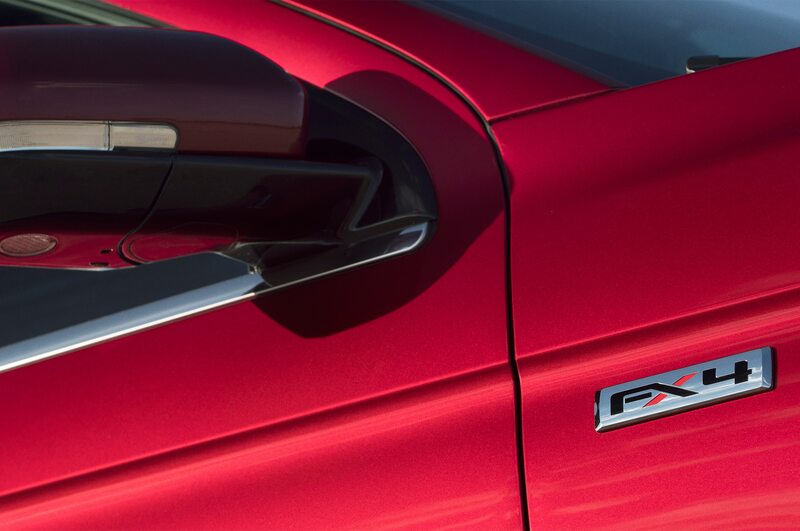 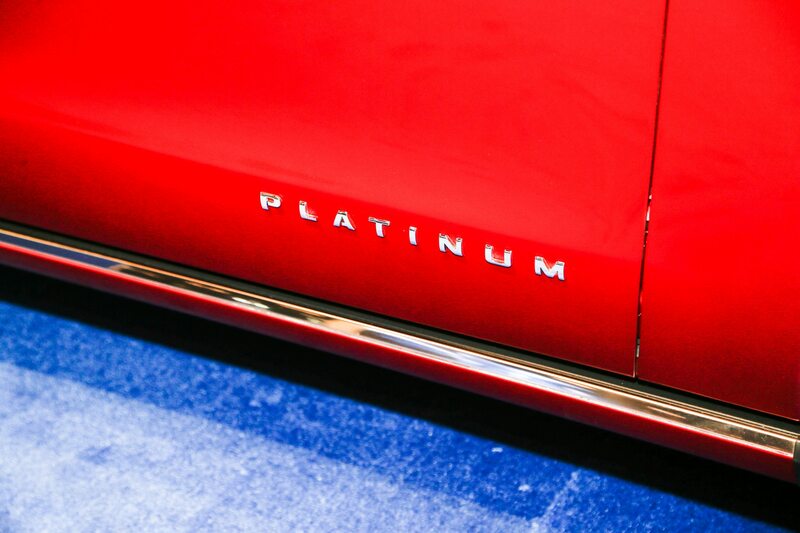 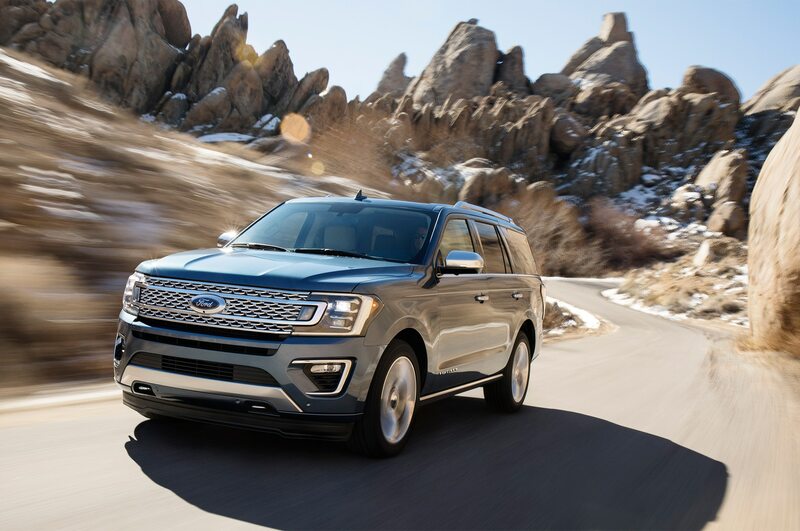 It puts out 375 hp and 470 lb-ft of torque in the XLT and Limited or 400 hp and 480 lb-ft of torque in the Platinum—both noticeable increases from the 365 hp and 420 lb-ft of torque on offer in the outgoing 2017 model. 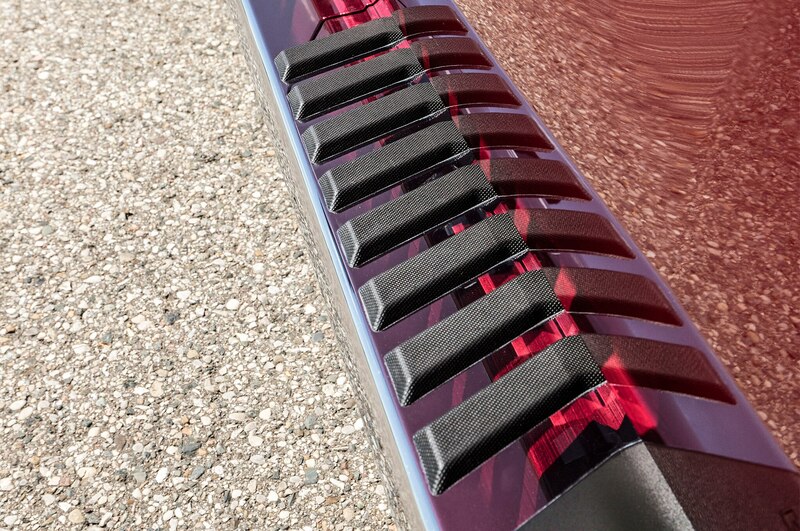 All trims can be had in 4×2 or 4×4 flavors. 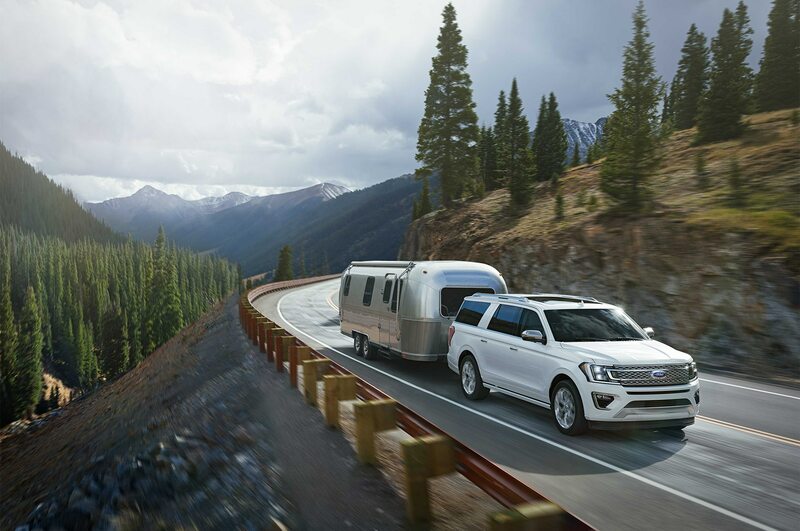 Routing power in all configurations is Ford’s new 10-speed automatic, a smart and smooth unit that’s happy in any situation, including when there’s a trailer strapped to the back. 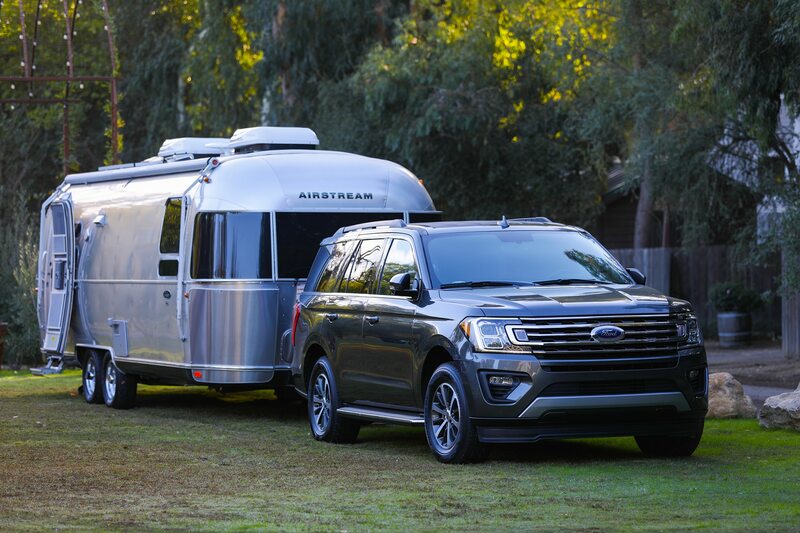 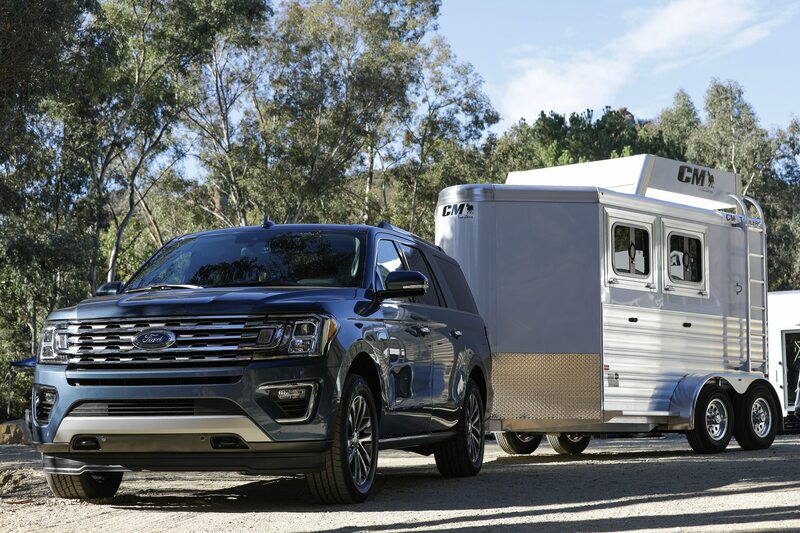 Making the Expedition an even better tow rig is the optional Pro Trailer Backup Assist, which makes backing up with a trailer almost as easy as backing up without one. 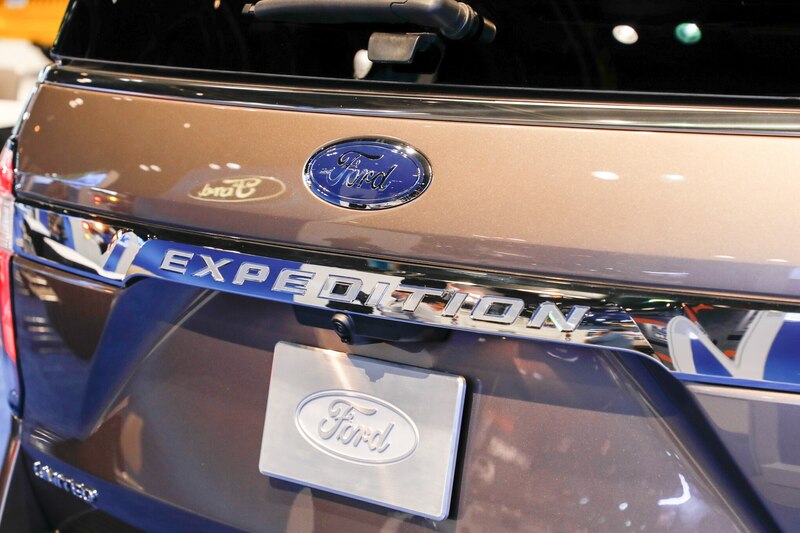 Setting it up is simple, requiring only a handful of measurements and the application of a sticker onto the hitch. 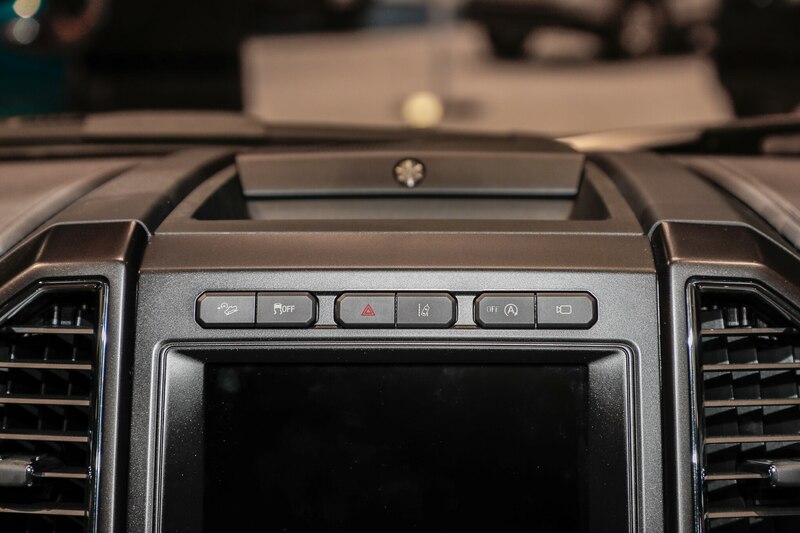 Then, when needed, you press the button in the middle of the rotary knob underneath the driver’s central vent to enable the system, and turn the knob left and right to direct the trailer. 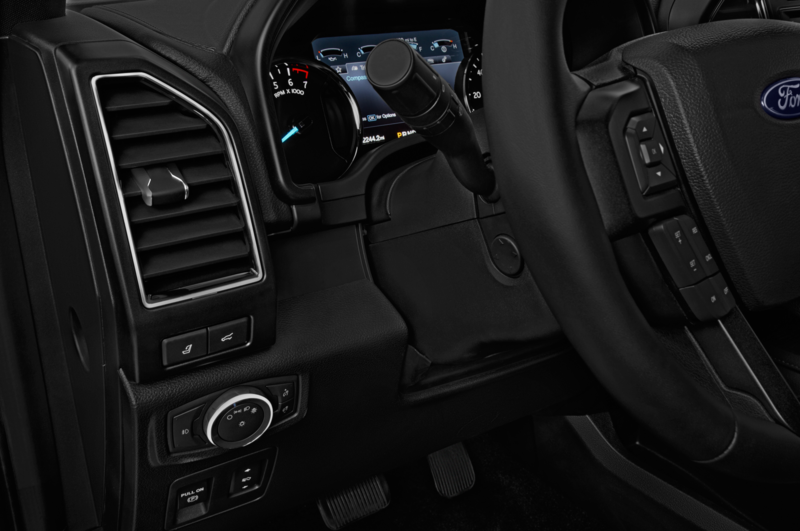 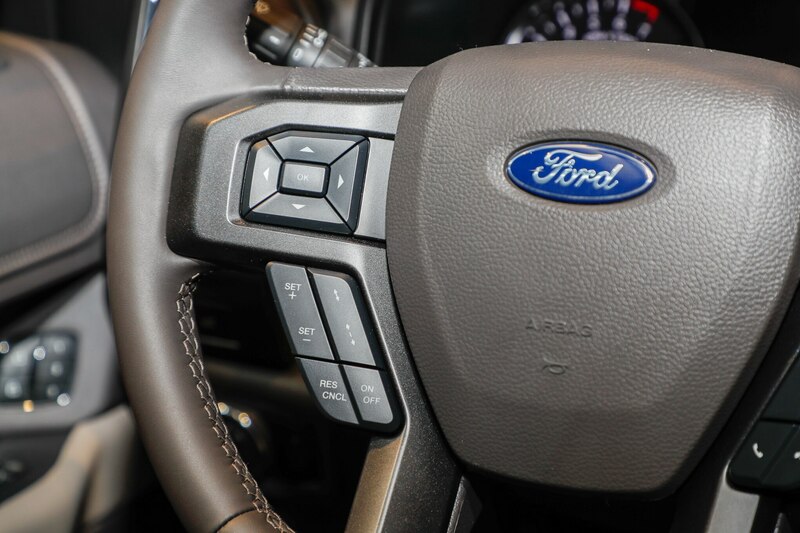 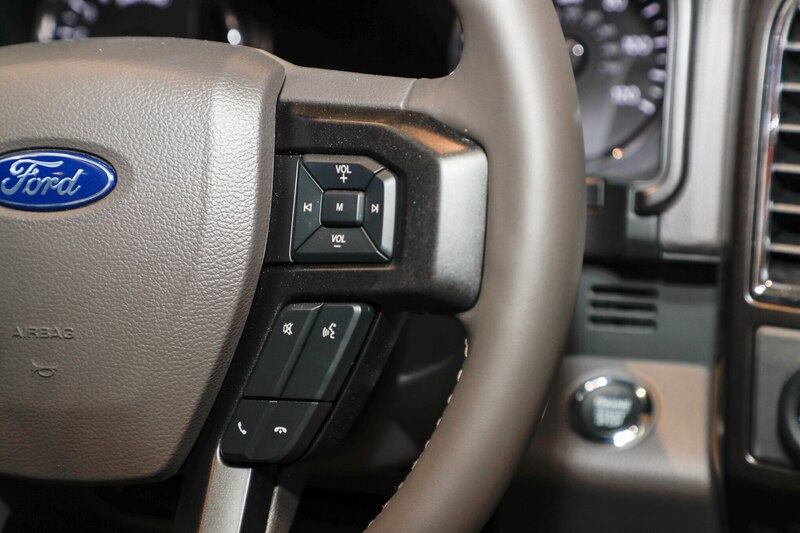 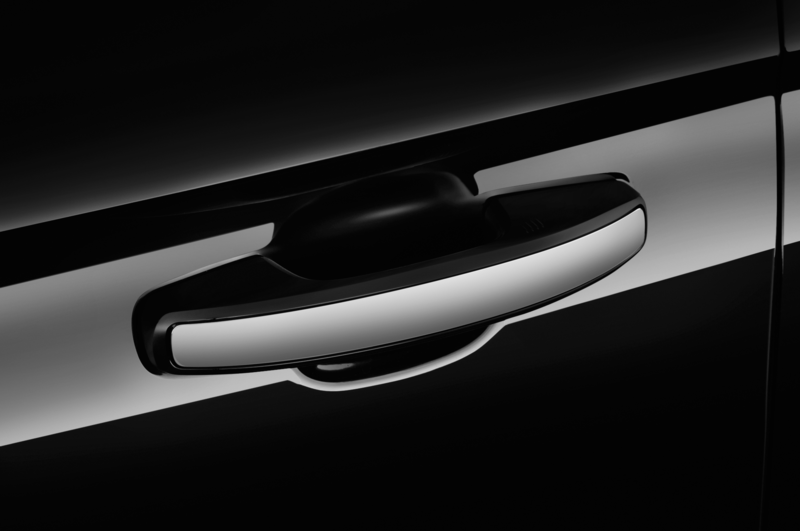 Though you’ll still be modulating the brakes and throttle as you would in any other backup situation, your hands won’t be on the steering wheel—the truck will handle that for you, with a much lower likelihood of jackknifing as a result. 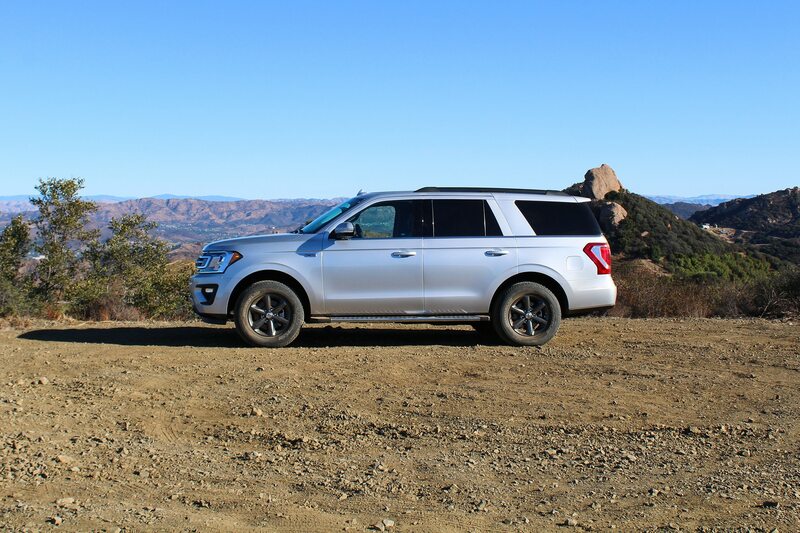 If your planned duty cycle calls for extensive traversing of off-road trails, consider skipping the Platinum’s bells-and-whistles for the optional FX4 package. 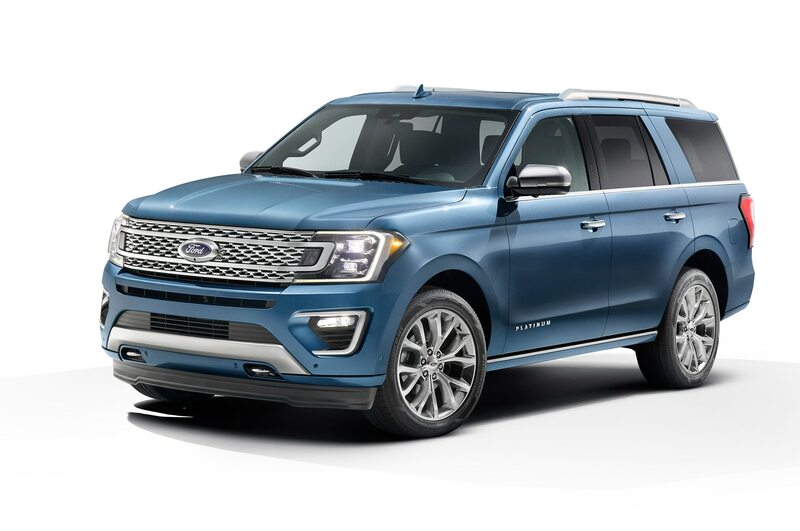 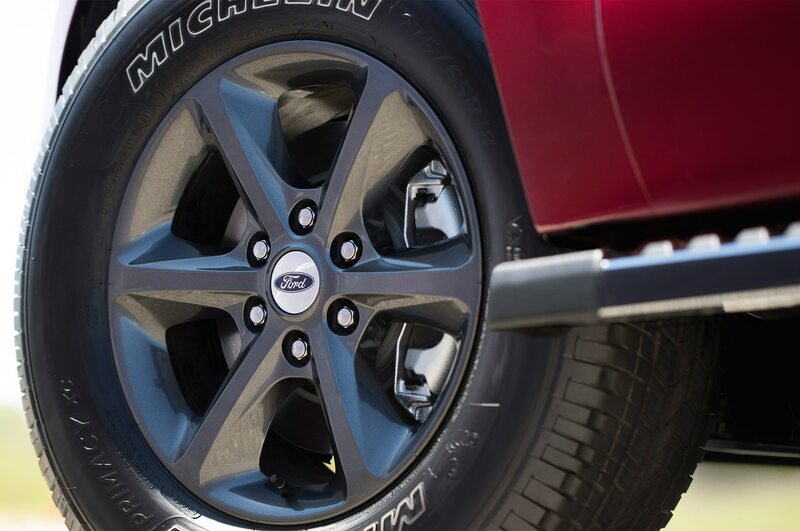 Available only on the Expedition XLT (in both wheelbase lengths), the $1,650 pack adds off-road shocks front and rear, skid plates that include protection for the fuel tank, platform running boards, and 18-inch wheels shod with 275/65R18 Michelin Primacy XC tires. 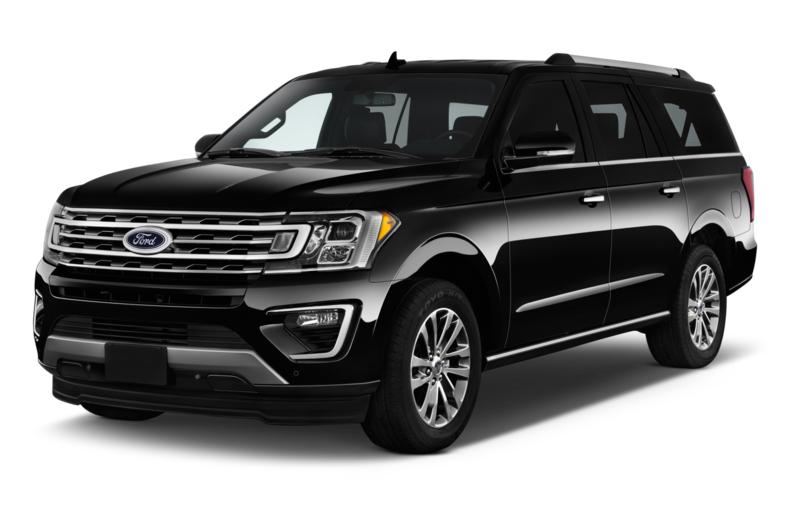 Despite its size—the Expedition is 81.6 inches wide, 76.2 or 74.6 inches tall (4×2 vs. 4×4), and 210.0 or 221.9 inches long (regular vs. Max), and weighs at least 5,443 pounds—the FX4 had no problems navigating the hilly trail outside of Calamigos Ranch. 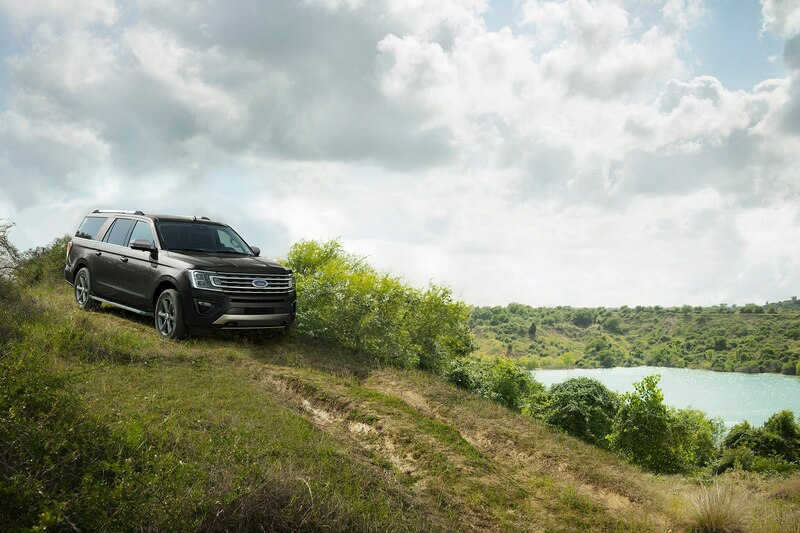 Though a far cry from the rock crawling exercises typically put on by the likes of Jeep and Land Rover, the route still featured plenty of hazards that called for a steady hand. 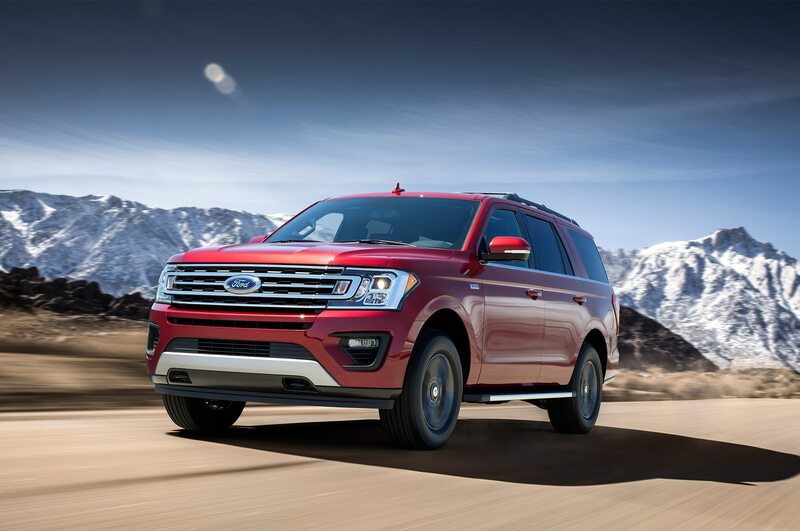 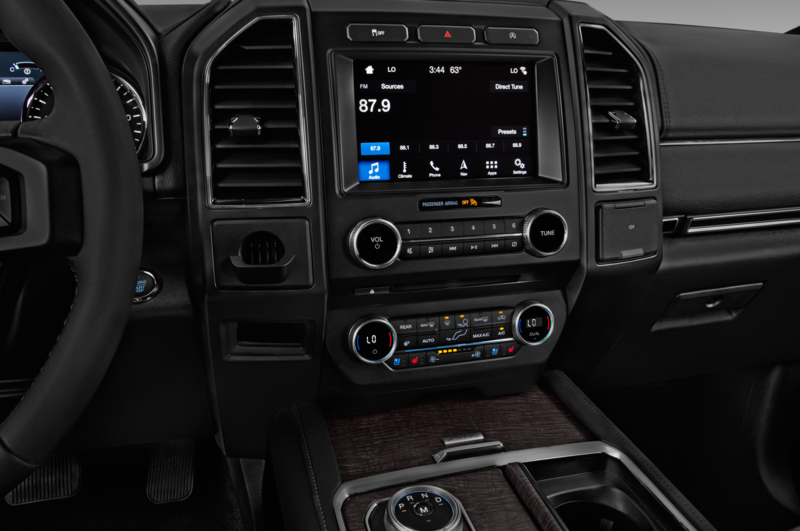 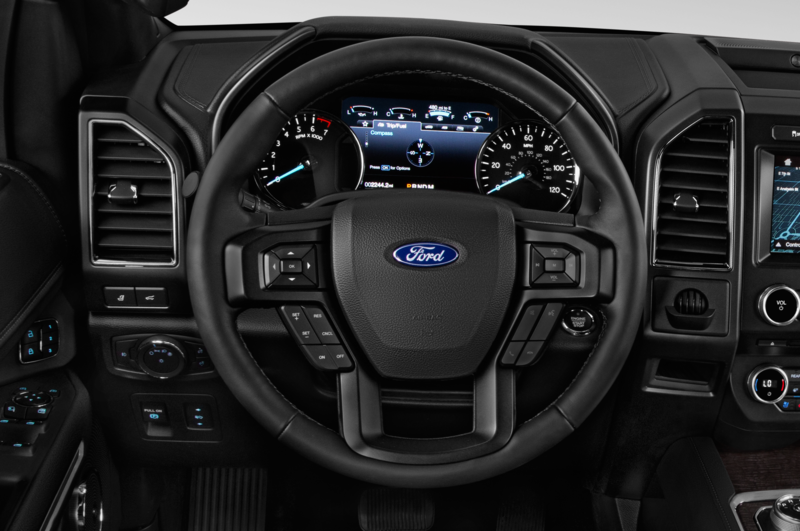 The Expedition’s built-in off-road mode sets steering, throttle, and transmission maps just right and the EcoBoost’s copious and smooth torque is perfect for “when in doubt, power out” situations, such as a steep incline on soft terrain. 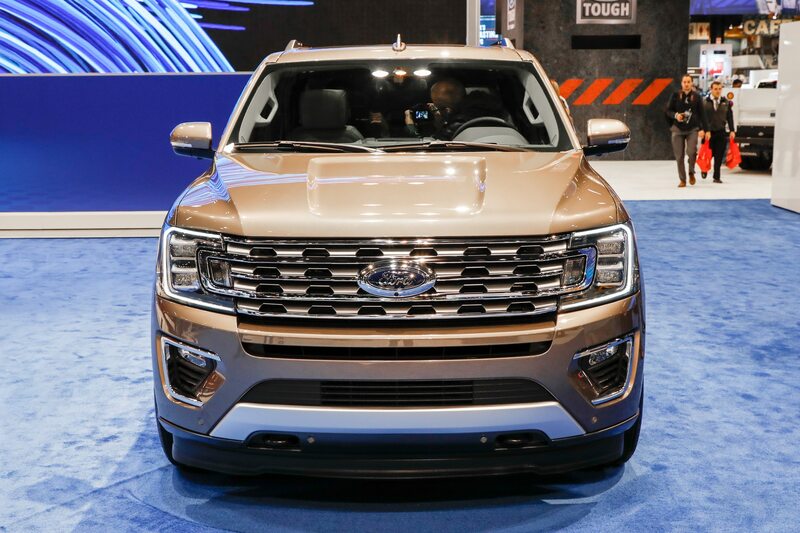 Its turning radius is much tighter than you’d expect for a vehicle its size, and there’s also a locking rear differential on hand for stickier situations. 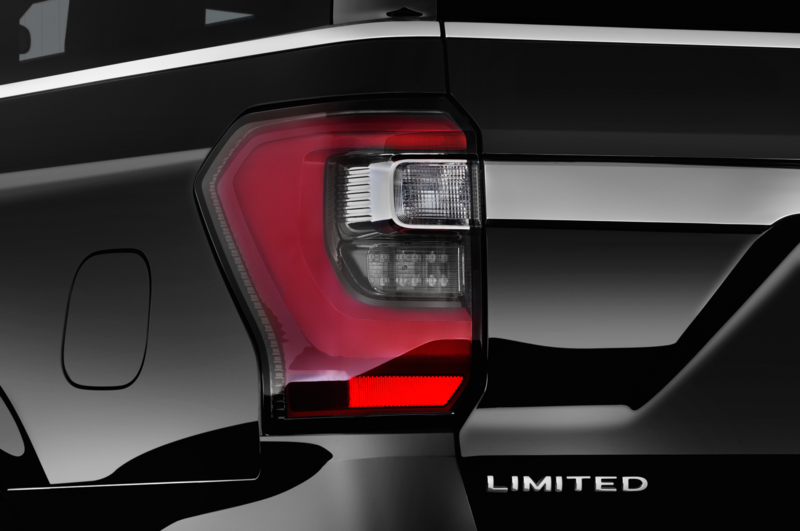 Still, you’ll want to avoid most Jeep trails out of size considerations alone. 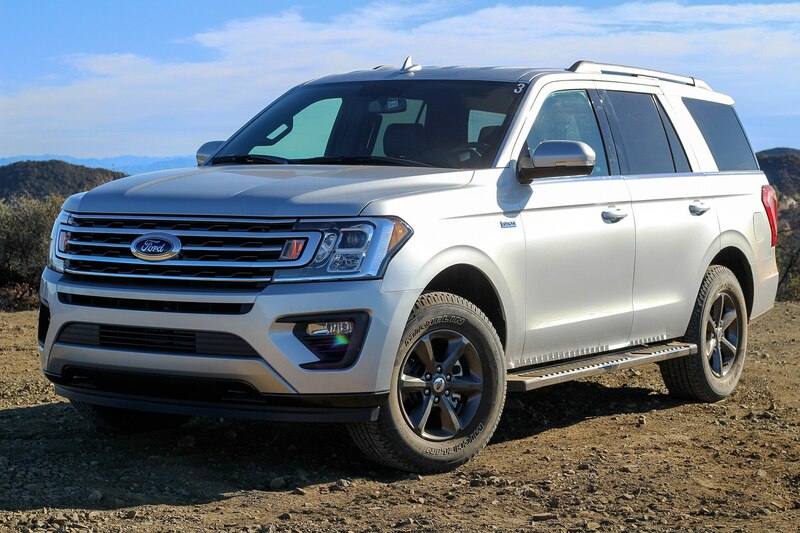 Composed and effortless is the order of the day for the Expedition on paved roads as well, regardless of the quality of said pavement. 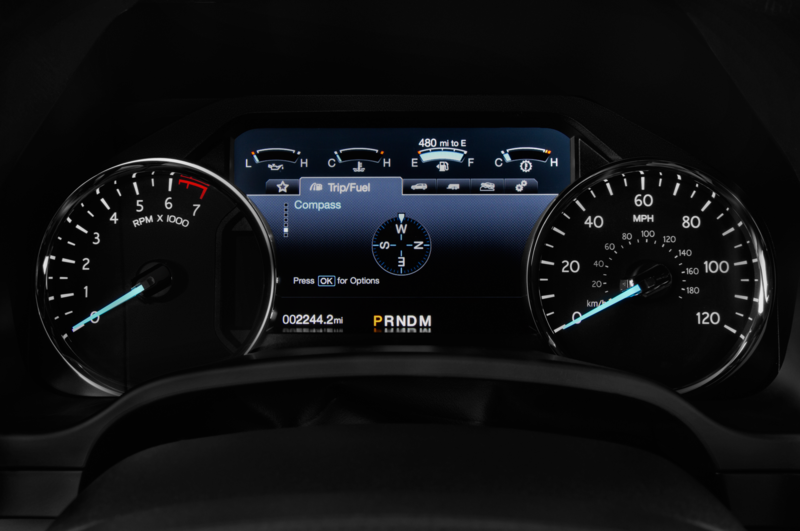 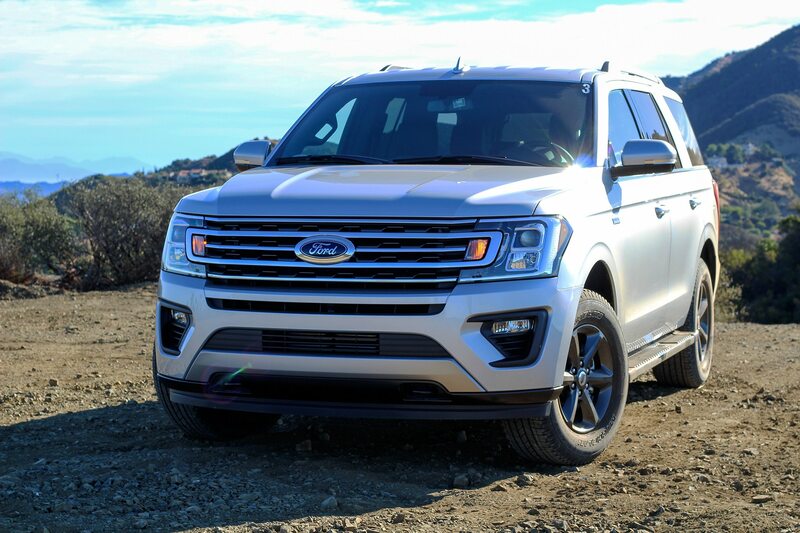 The EcoBoost V-6 is a quiet mill unless you’re on it, and in the Expedition Platinum, it’s barely audible. 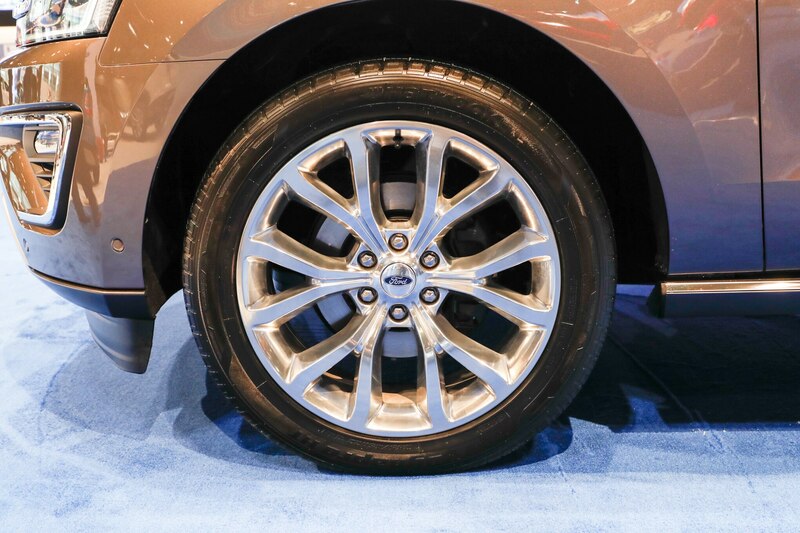 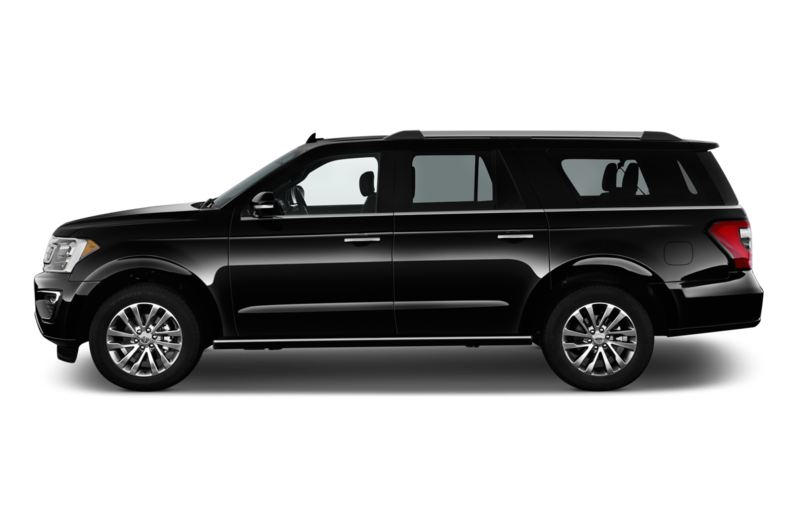 Wind and tire noise levels are close to those of the Navigator—that is, close to non-existent. 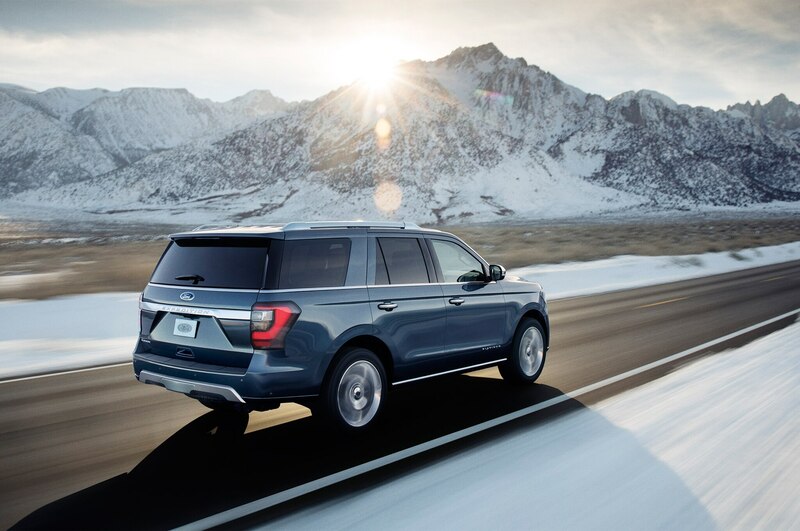 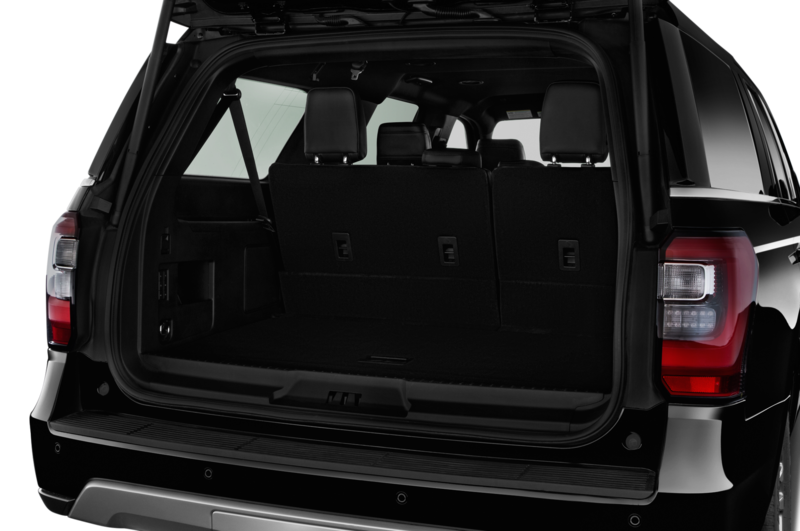 Though it’s sprung to be a comfortable cruiser, the Expedition isn’t a rolling chicane once you hit the hills. 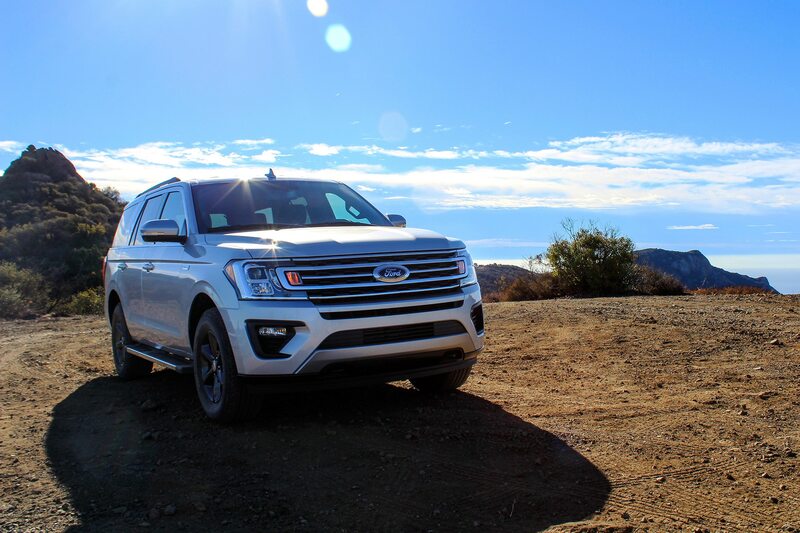 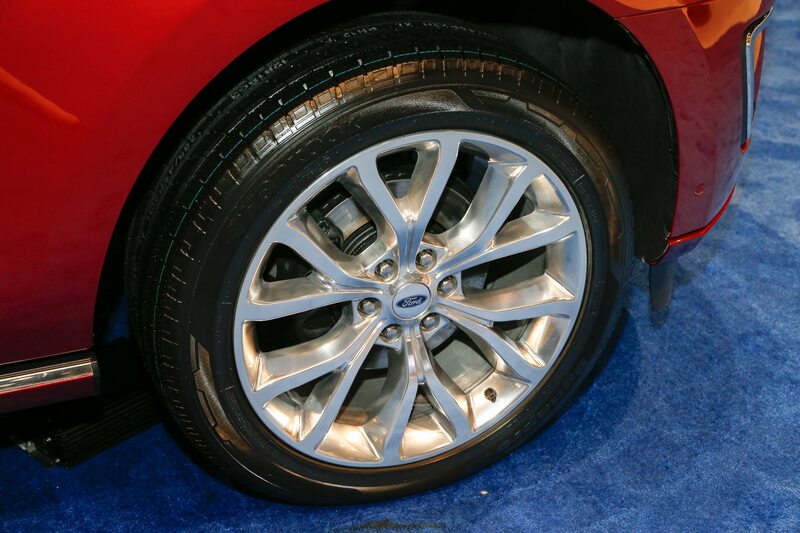 While not exactly fun to huck left and right, the big Ford will have no problem keeping pace on most mountain roads, especially if you switch into Sport mode, which tightens inputs just enough to provide an extra dose of confidence. 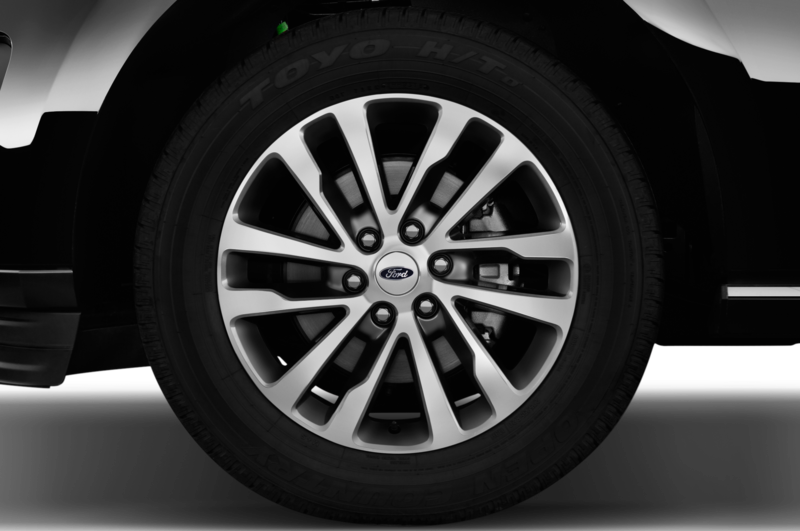 No matter what mode you engage though we wouldn’t recommend tackling any autocross courses. 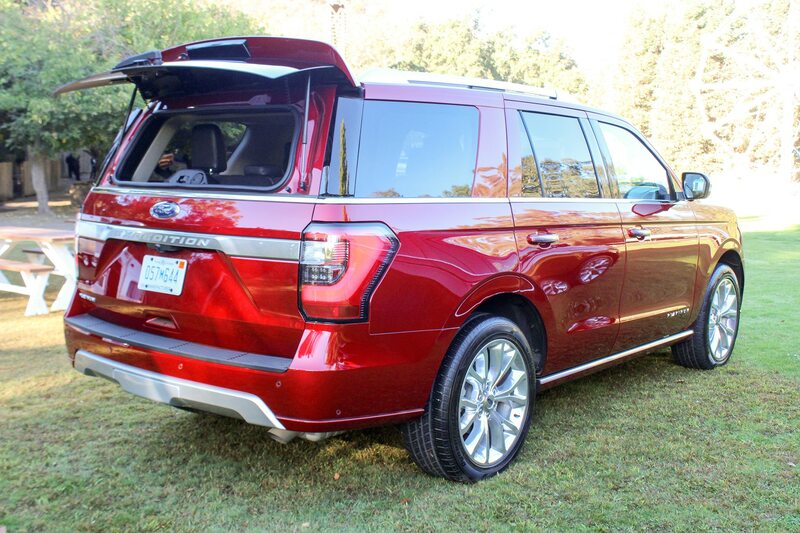 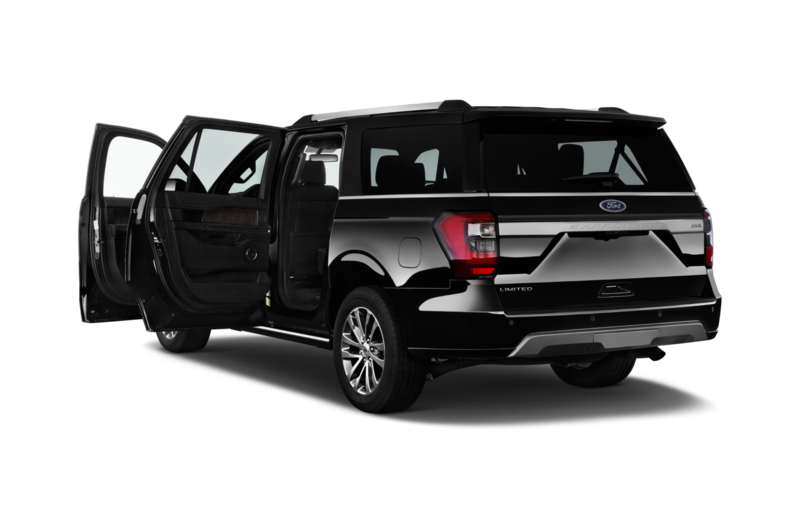 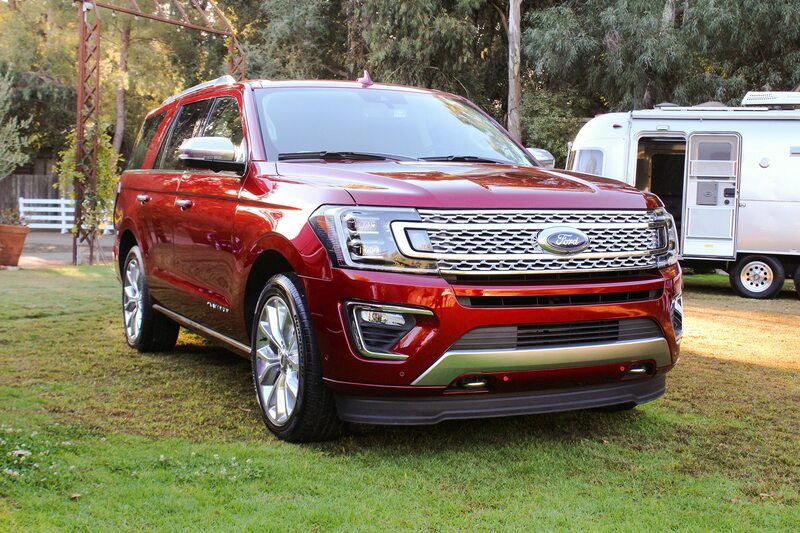 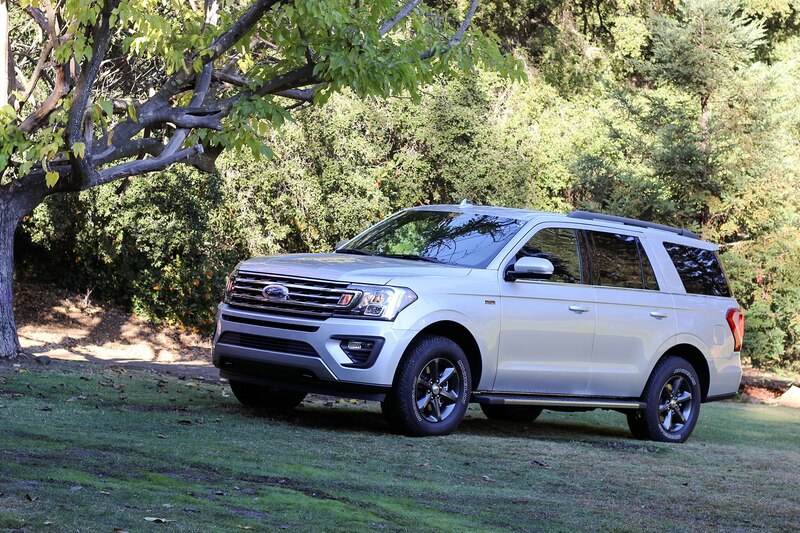 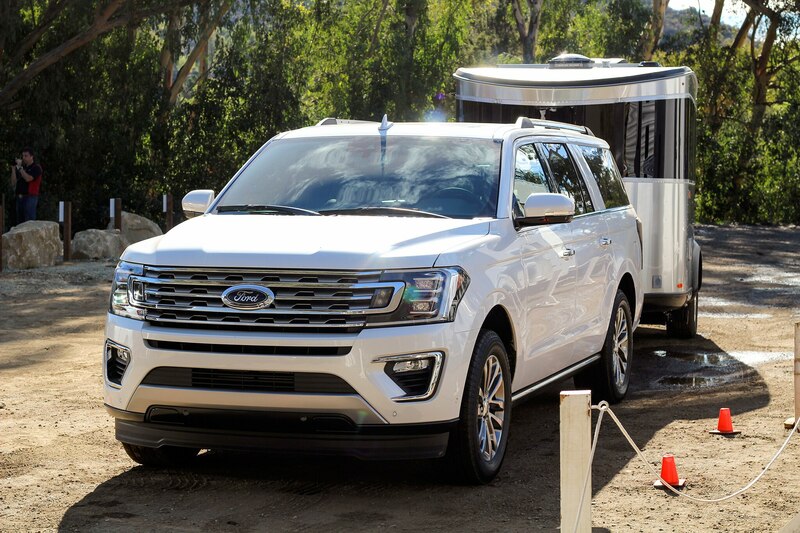 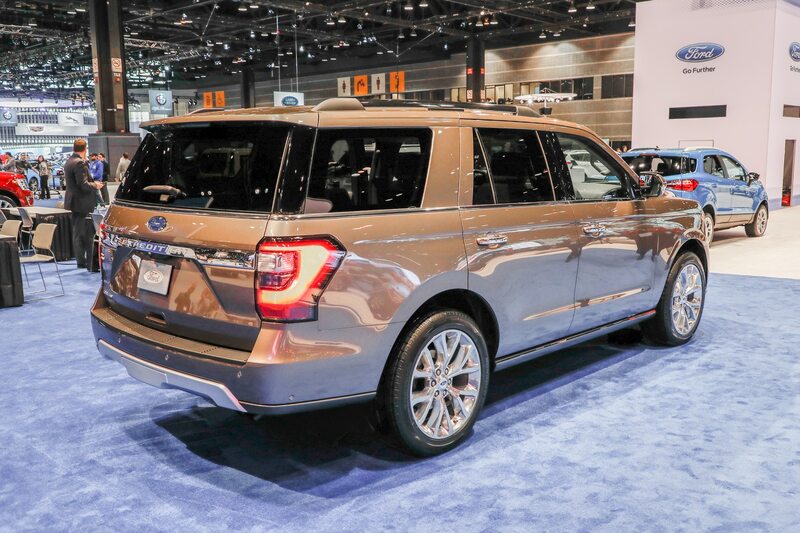 With a starting price of $52,890 that tops out in the low to mid $80s, the 2018 Ford Expedition is a long way away from being a budget family hauler. 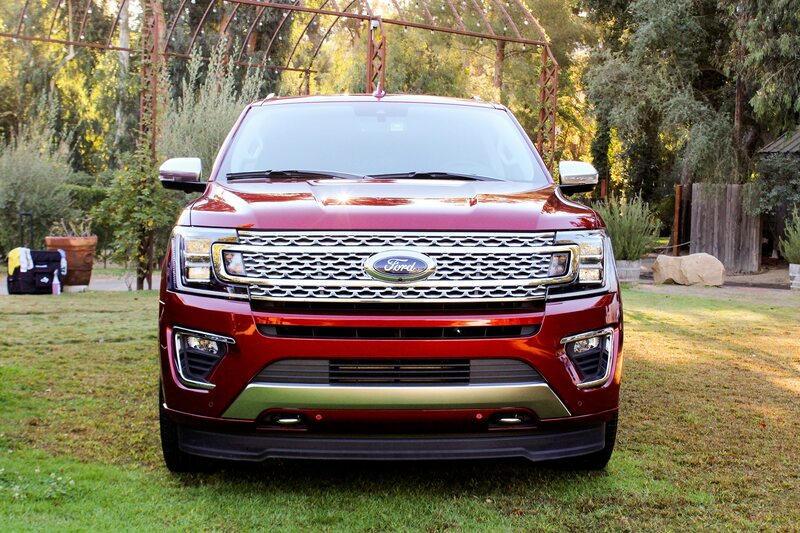 Refinement and equipment levels are up to snuff, however, and as the F-150 has shown, we Americans have no problem paying big bucks for big trucks from non-luxury brands. 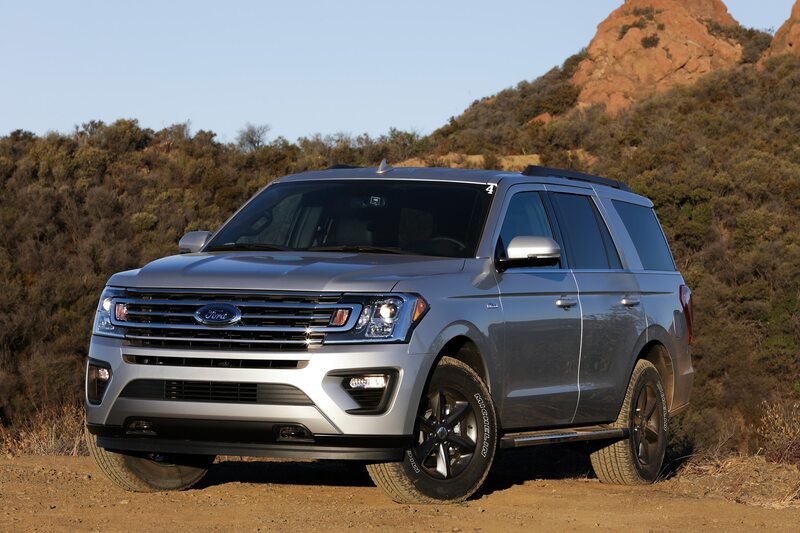 For our money, a well-equipped Expedition is a better buy than a similarly priced Navigator, which is at its best in the $90k-plus Black Label flavor. 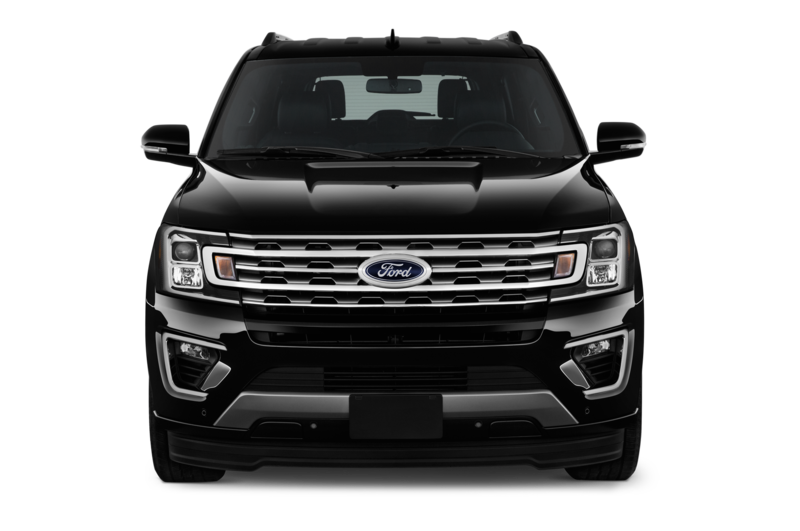 While its size makes it overkill for many, the Expedition is a great choice for a prosperous, populous clan with a lot of toys.